Well I finally got around to writing up this report. I can’t even count how many of these reports I’ve written on this forum and others, so I hope my report can be as helpful to future EDers as previous reports were to me when planning this trip. 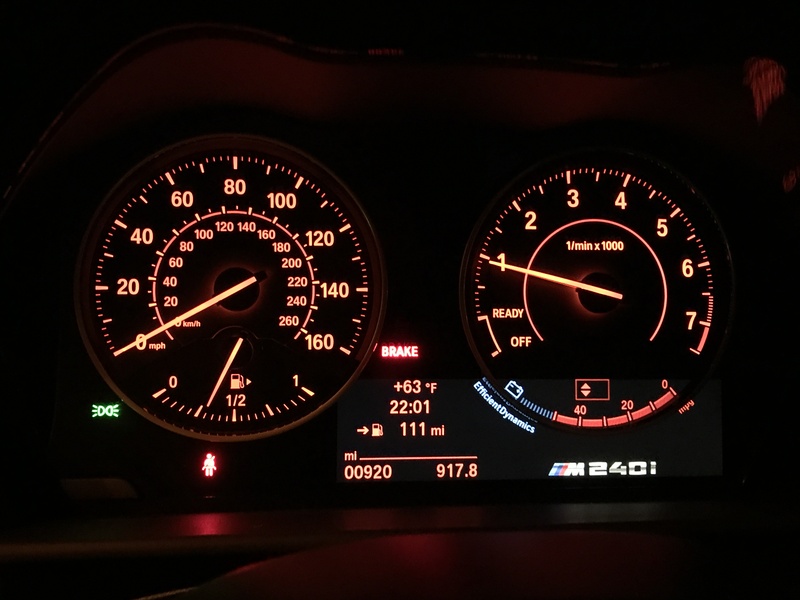 I previously had a 428i lease that I got back in 2014. 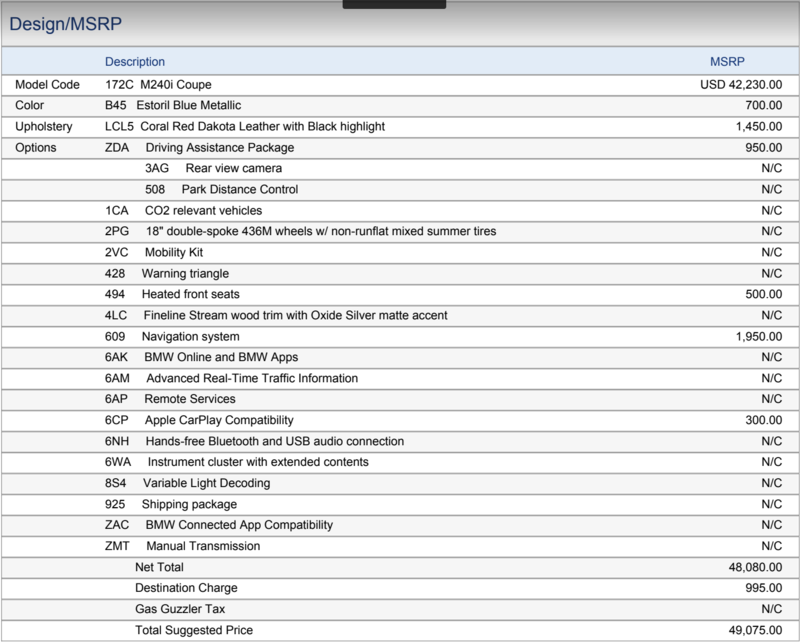 At the time I really wanted to buy a CPO E92 and it was a hasty, unsearched decision to lease an F32 instead. 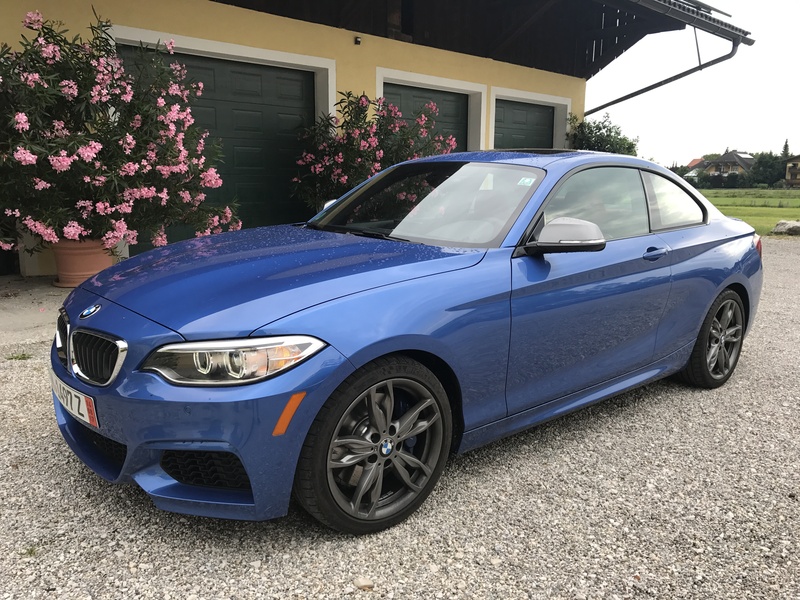 2 years in, it was time to think about my next car and the M235i (and then M240i) soon became my target. 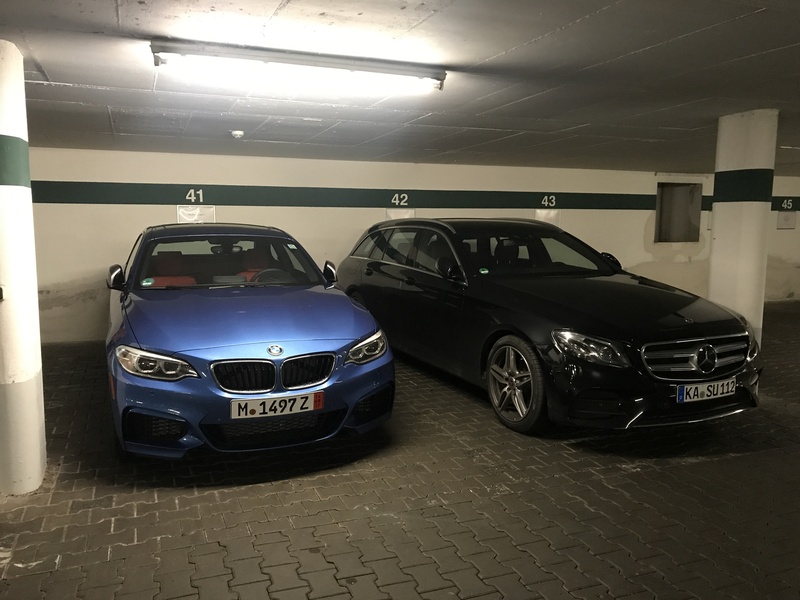 The 4 series was far too big for me, and I loved how for around the same price I could get a 6-cyl engine, M-sport and Track Handling packages, and a more sporty , unique car (This was before the M2, but barely). 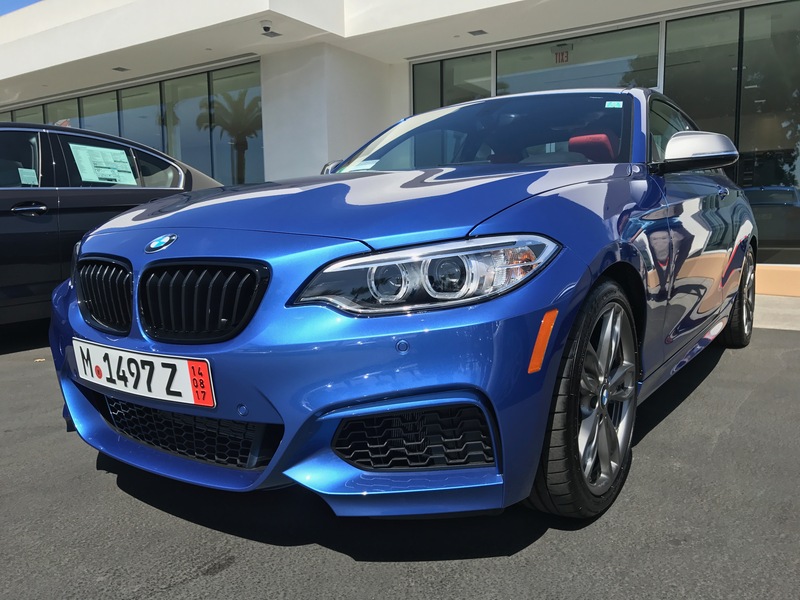 When it came time to ordering the car, I contacted about 10 dealers in both northern and southern California. 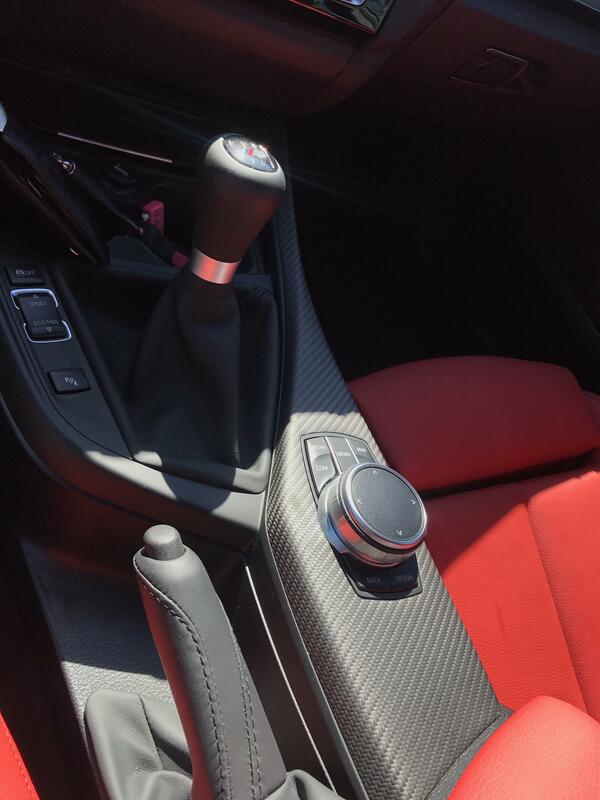 The dealer I went with initially offered me invoice - $600 so of course I jumped on it, but we later came to find out that there was with a $1500 market allowance which wasn’t around when it came time to rate lock / contract. It was a messy and unfortunate situation, but because of the uniqueness of the ED program my car was already built and my flights were booked for that next week so the usual “just walk away” adage did not apply. 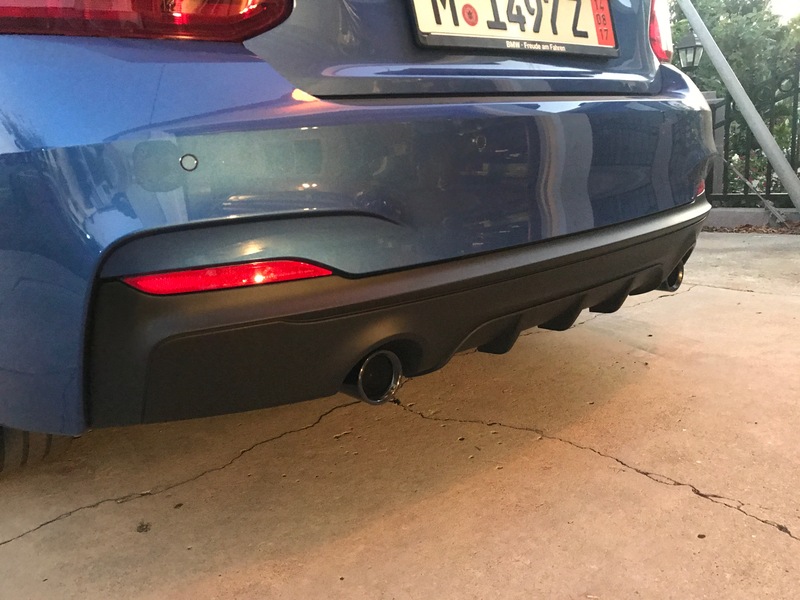 In the end, I ended up at $400 over ED invoice, base MF, and black kidney grills thrown in and installed for free. I locked in April and that ended up being the best program when I signed in July since MFs and residuals only got worse. I miss my F32 lease for the 63% residual and 0.00129 MF. 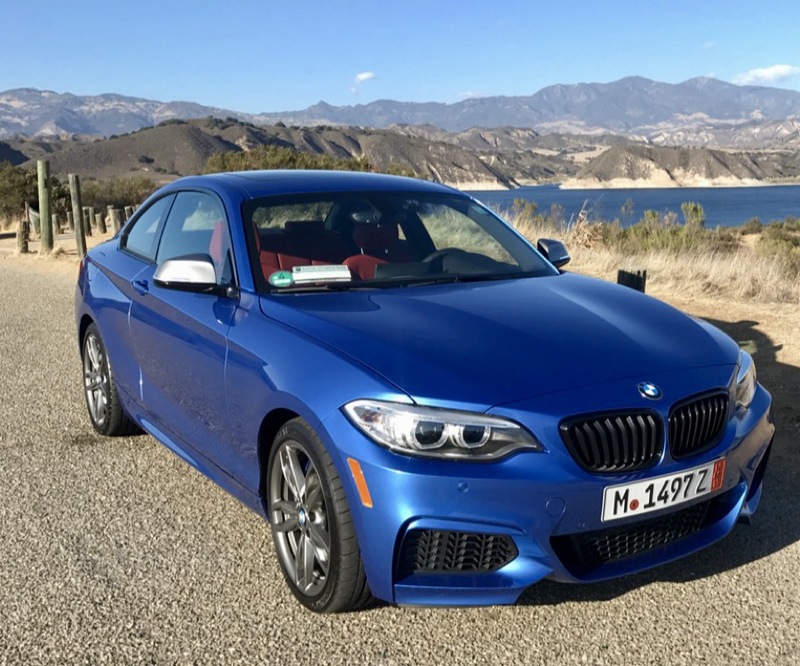 The good thing about signing in April was that April was the last month of the multiple security deposit (MSD) program, so I got to roll over my existing MSDs from my F32 lease into the M240i. Last edited by keylime503; 10-09-2017 at 09:32 PM. The big day had finally arrived! We were supposed to wake up at 4am in order to leave for the airport at 5. Instead, I woke up on my own at 2am wide awake and ready to go. I tried for about 10 seconds to convince the sleeping girlfriend that we should just get up now and go early, but she did not share my excitement at this point of the trip. 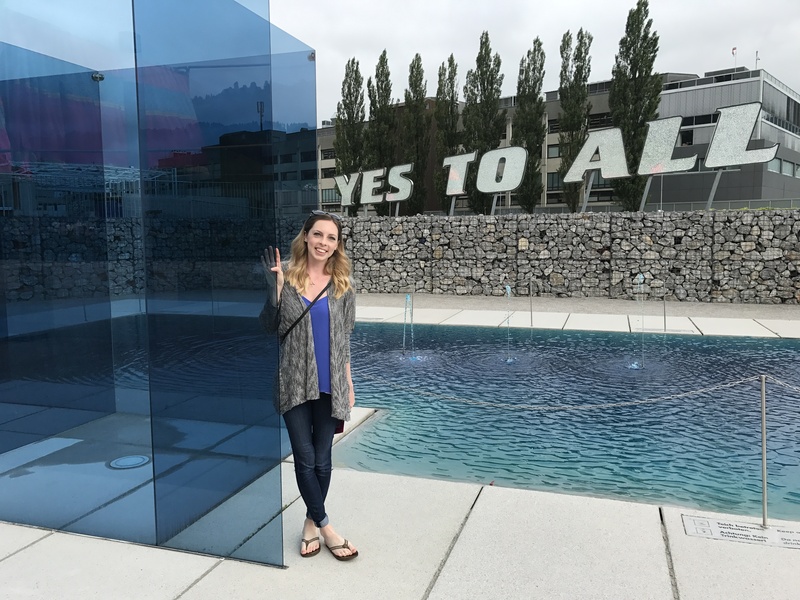 We use 62,500 FlyingBlue points each (transferred from American Express Membership Rewards) to book our flights from Orange County -> Seattle -> Amsterdam in Delta One (Delta’s idea of First/Business class). 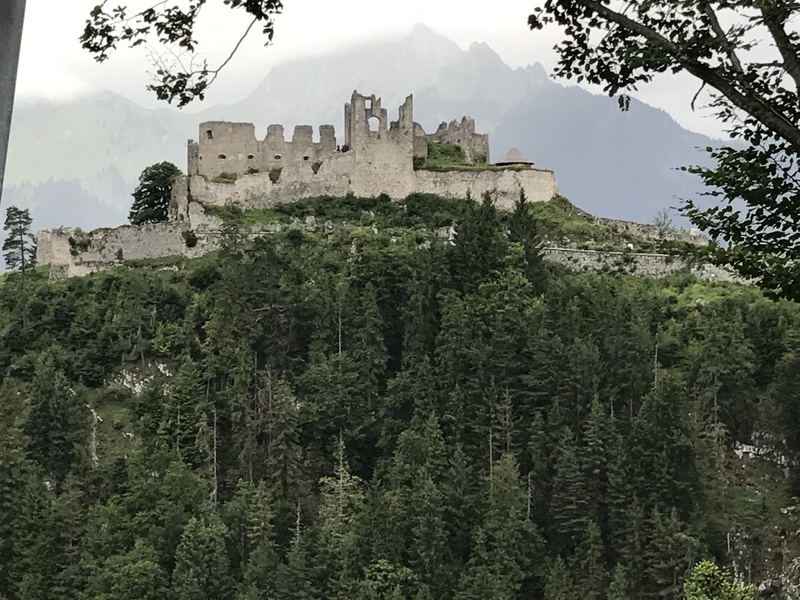 Cash flights to Europe are so cheap these days that if you’re going to use points, it makes no so sense to go Economy since you could probably use less points by redeeming points for cash at $0.01/point and then paying cash. This would be my girlfriend’s first time in international business class, yet it seemed I was more excited about that fact than she was. The flight over was pretty uneventful. 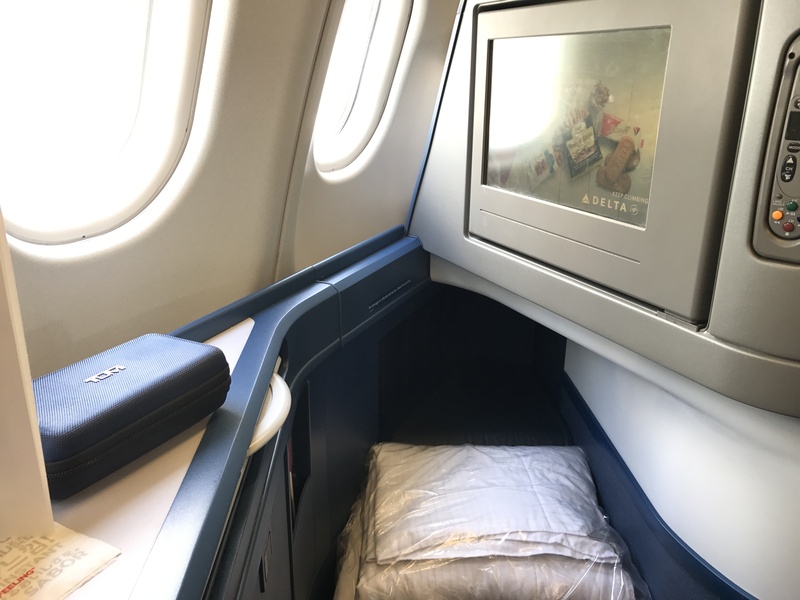 I have a huge problem sleeping on planes (even with a flat bed in Business) and this flight was no different. It left Seattle around 1pm and arrived in Amsterdam at 8am local time. I got an hour of sleep, if that. Coincidentally, I’m currently typing this on a flight from LAX to Hong Kong because once again, I couldn’t fall asleep so I finally started writing this report instead. We spent the day in Amsterdam visiting a good college friend who had moved there after graduation. 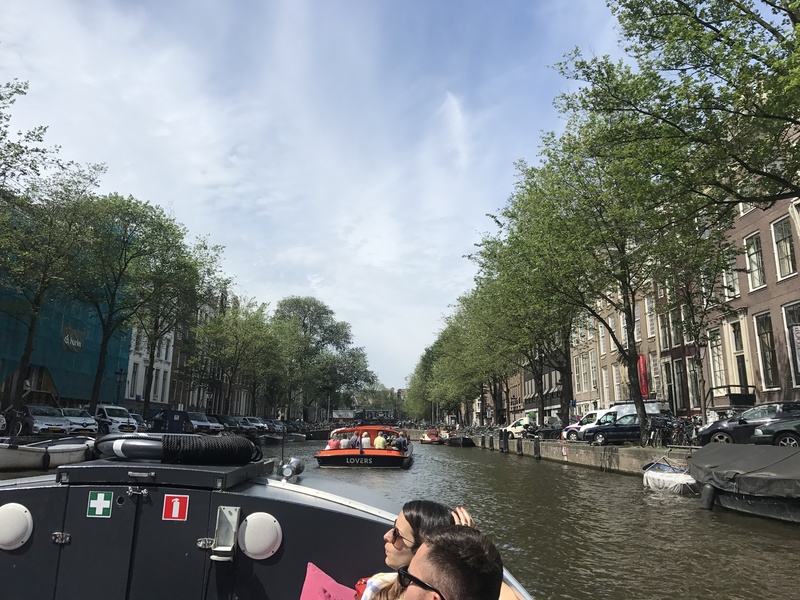 This was my girlfriend’s first time to Europe so we just spent the day exploring the canals and taking in that European big-city feel, since we wouldn’t really spend any time in cities the rest of the trip. In the evening we headed back to the airport to fly to Munich and this is where my lack of sleep the previous night (which wasn’t helped by the fact that I hadn’t really eaten anything all day) started to really catch up with me. I started feeling ill while waiting at the gate and at one point was worried if I’d even make it to this flight. We got on the plane (Eurowings flight I booked for like $50/person) and ironically, after 10 hours in a flat bed with no sleep, I promptly fell asleep sitting upright in the middle seat before we’d even pushed back from the gate. I guess that’s the secret? 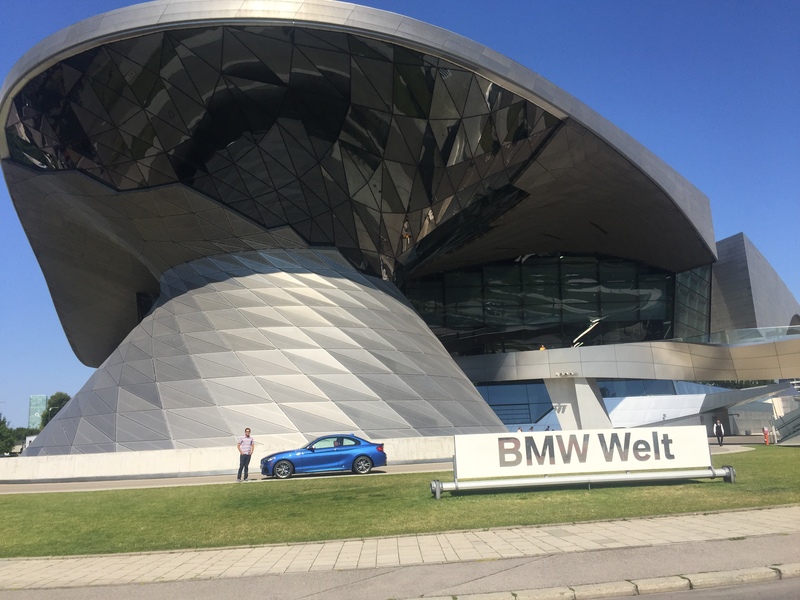 We landed in Munich and any notion of feeling unwell went out the window because it was BMW time! 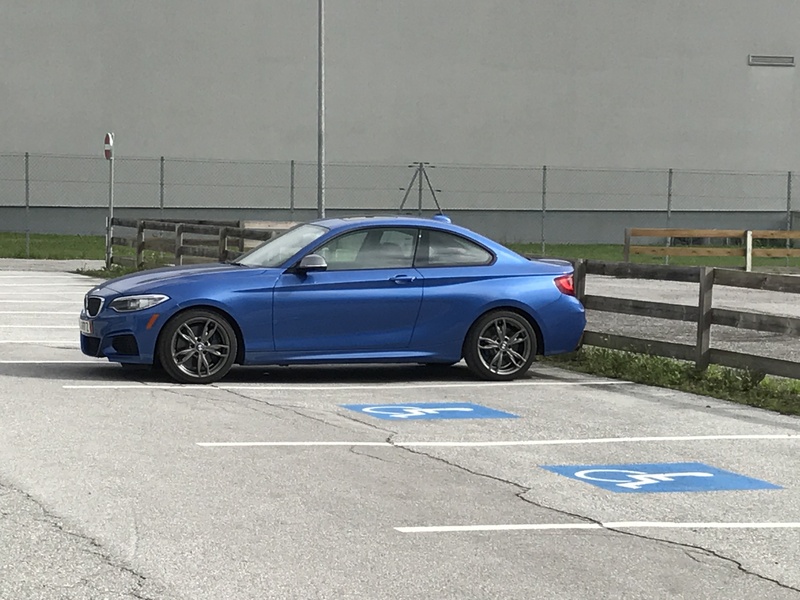 The pre-arranged and complimentary SIXT driver was waiting outside customs with my name on a sign, and a brand new G30 5 series was waiting right outside on the curb. The driver was a man of few words as others have alluded to in other ED trip reports. 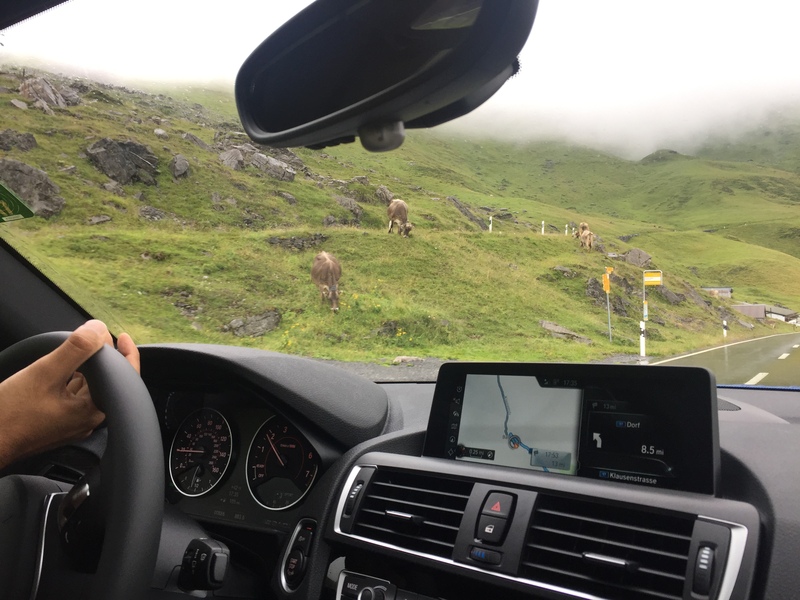 However, once I started to ask about the European road signs we were passing he opened up and started talking for the rest of the trip. Perhaps he just needed a topic to discuss, or he was annoyed with other Americans and their driving etiquette in Europe and wanted to make sure I understood all the customs and signs. 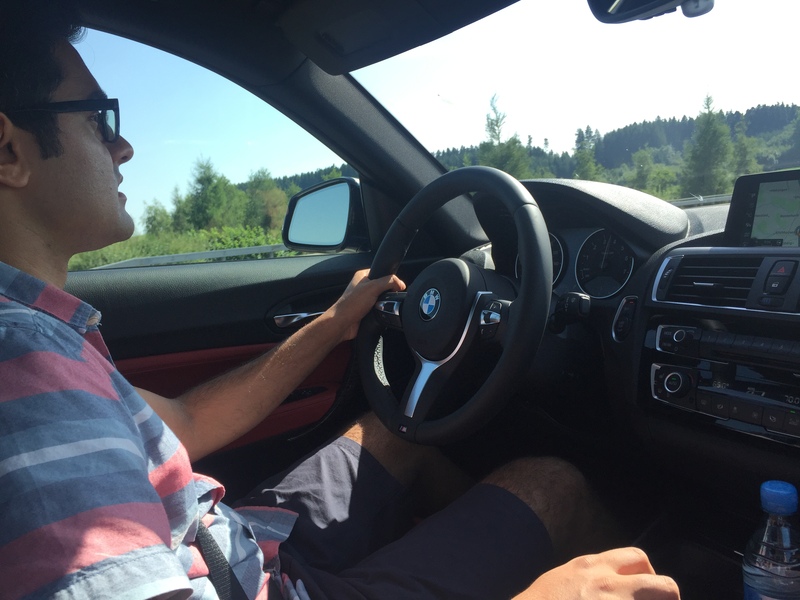 He was also happy to talk about how much he loved the G30, and opened it up to 220kph on the way into Munich. 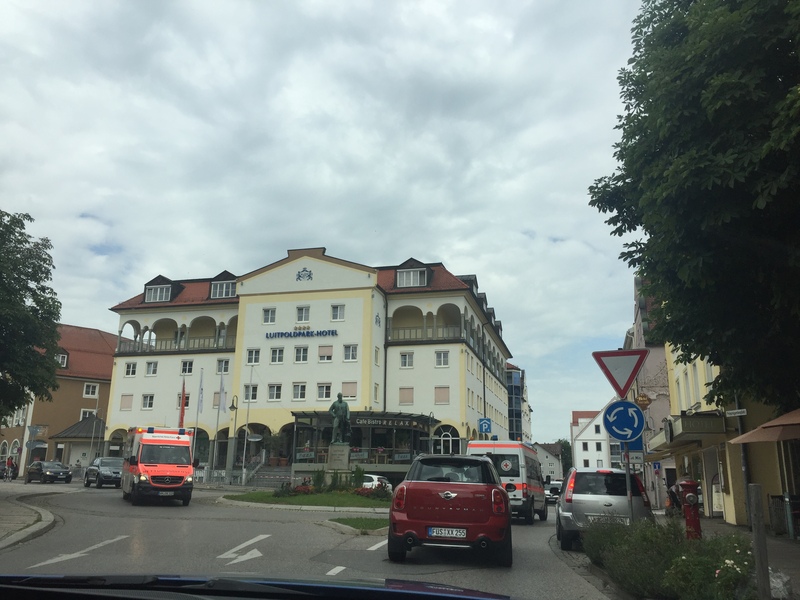 We arrived at our hotel (Sendlinger Tor Hotel One, ~$100) which I chose for its location. It was adjacent to a U-bahn station on the same line that goes to the Welt, to make things easier in the morning. 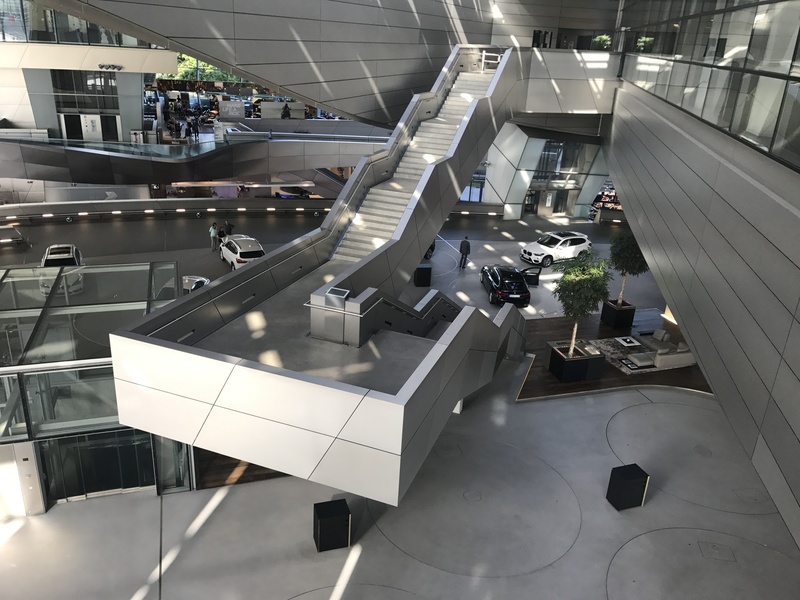 The hotel was clean, modern, and I highly recommend it for a quick overnight stay. 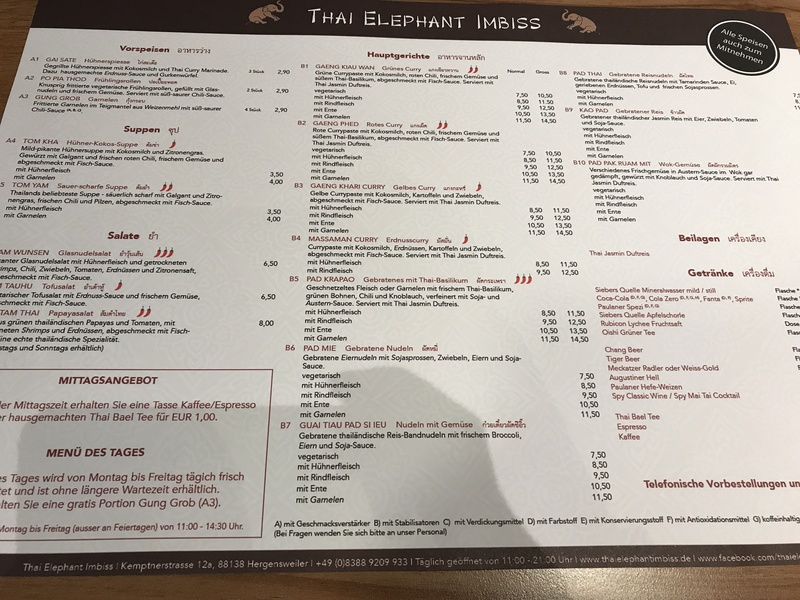 We walked into the historic part of Munich for a quick bite to eat (nothing to write home about) and then went to bed. Last edited by keylime503; 04-11-2018 at 04:58 PM. Once again, I woke up far earlier than my alarm dictated ready to get an early start on this amazing day, but my travel partner was content to sleep as long as possible. When I finally convinced her to get up and get moving, we walked a block to the U-bahn station. The ticket machine required you to specify your destination zone and I couldn’t figure out on the map which zone the Welt station was so I went with Zone 2 (Munich central was Zone 1). Turns out almost the entire U-bahn system is in Zone 1, so a little money was lost there but oh well. Shout out to the Bank of America Travel Rewards card, basically the only U.S. credit card that supports Chip+Pin (as opposed to the traditional Chip+Signature) which is needed for European stations. My excitement was quickly ramping up as we got closer to the Welt. Upon arrival, we took the elevators to the 3rd floor premium lounge where we were quickly and efficiently checked in. The lady offered to move our delivery up from the scheduled 10:00am to 9:20am which I accepted. I ended up being the first delivery of the day. At 9:20am on the dot, we met Robert our delivery specialist. 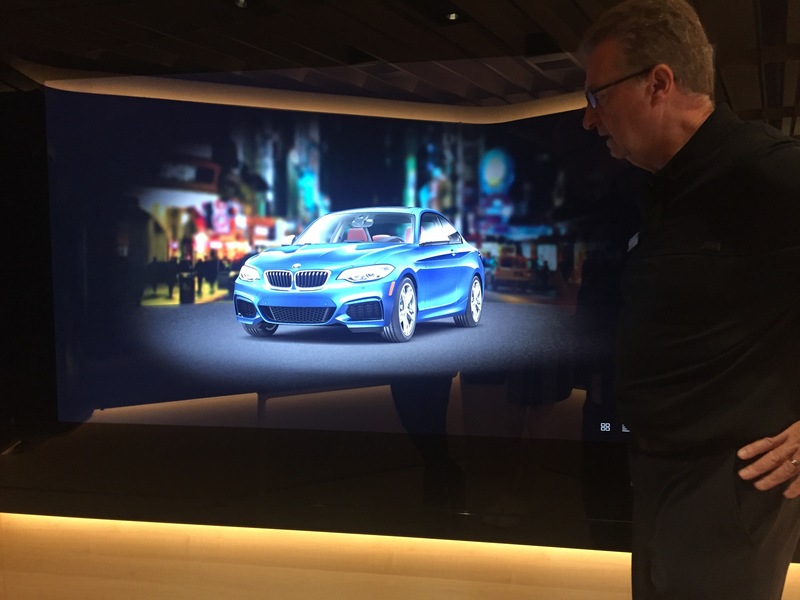 He took us down to the product display room, which was filled with these awesome 4K displays that the delivery specialists use to go over the features of the car. 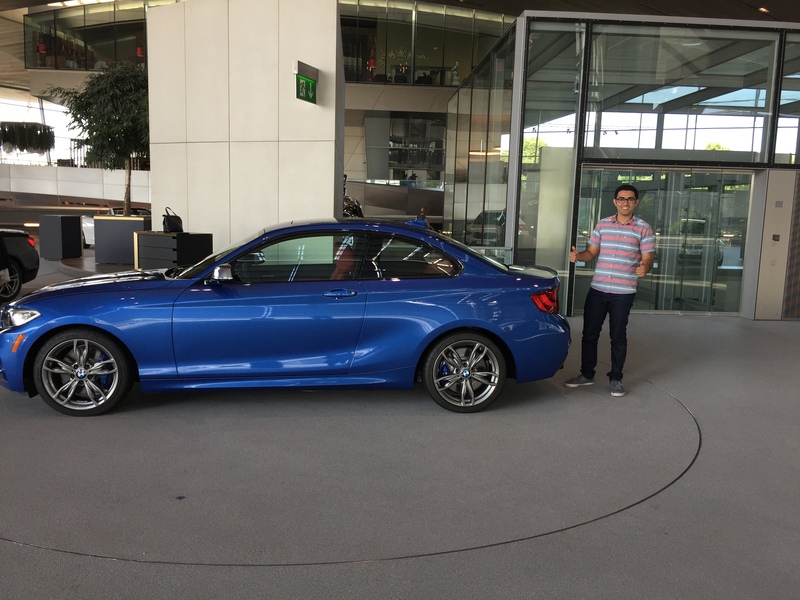 Robert was awesome, he quickly narrowed down my level of familiarity with the current F-chassis features and tailored the presentation to focus on aspects I was not familiar yet. Finally it was time for the big event. We walked down the floating staircase, turned the corner, and there she was! After that, we dropped the car off with the valet (complimentary for ED customers) and went for the factory tour. No photos were allowed as was expected, but I highly recommend this tour. The English-language tour is once a day at 11:45am. 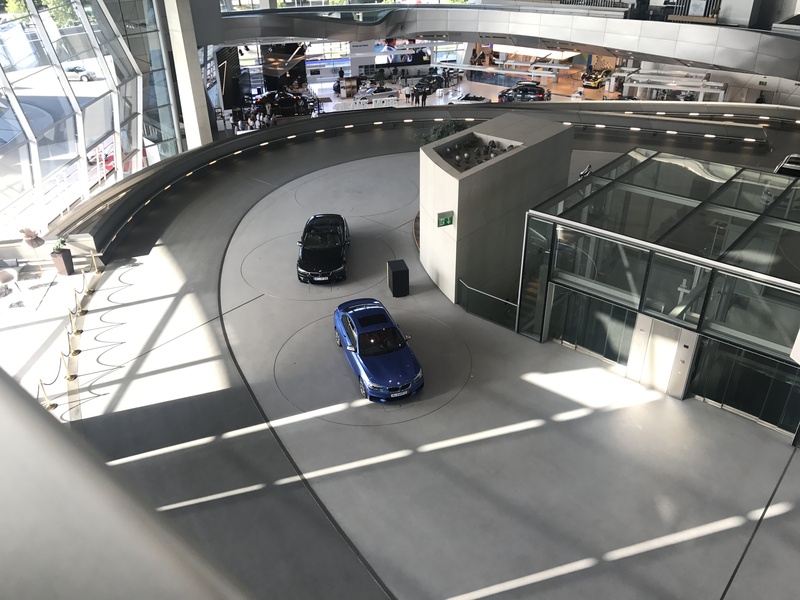 After the tour, we went to the BMW Museum across the street. To be honest, we were both underwhelmed but we’re also the kind of people who get bored with museums quickly. So in case you have to pick between the factory tour and the museum, I definitely recommend the factory tour. By this time, it was 3pm and unfortunately Munich rush hour was starting to pick up. 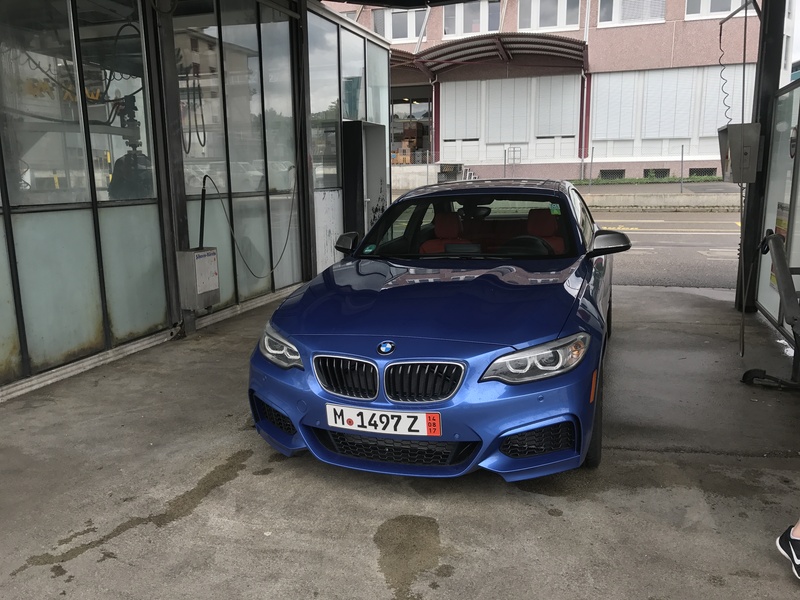 So my first ~30 minutes with my new M240i was spent mostly in 1st gear and I became familiar with the clutch travel very quickly. 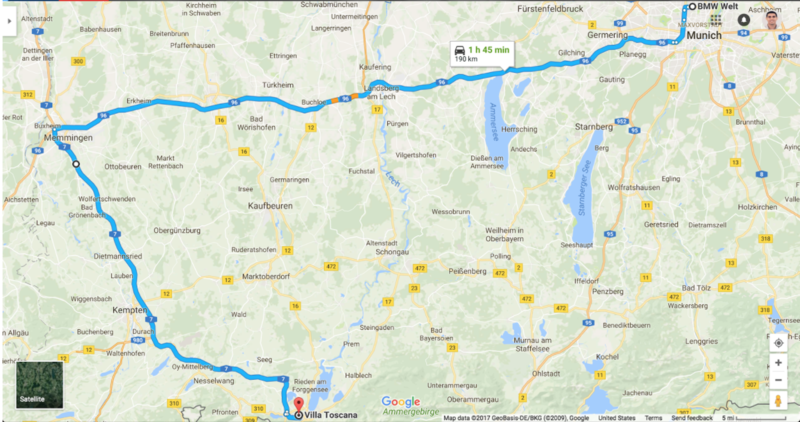 I chose today’s route to Fussen because it afforded the highest amount of unlimited-speed sections on the autobahn (see map of speed limits below), despite being about 20 minutes longer than the most direct route. As for the part you all care about, yes the car was amazing and drove exactly as I expected. 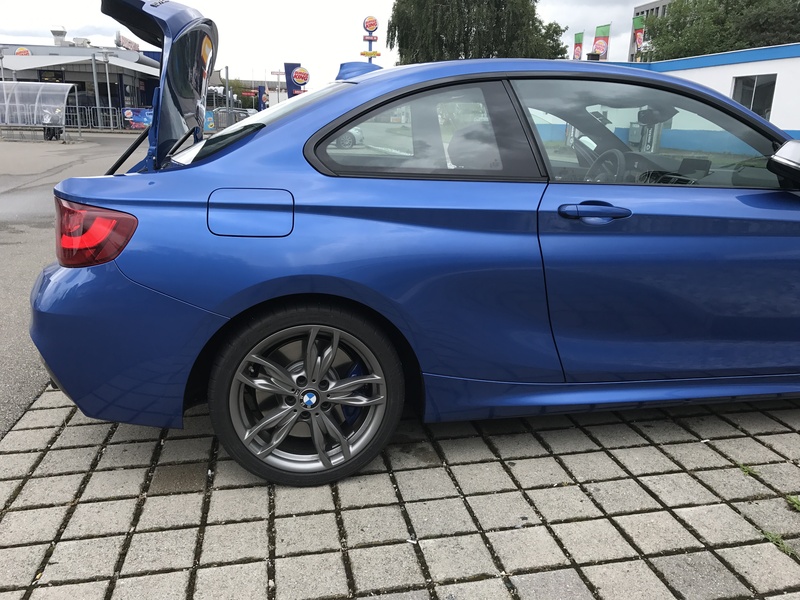 Coming from a base F32, the adaptive M suspension was something that was new to me. 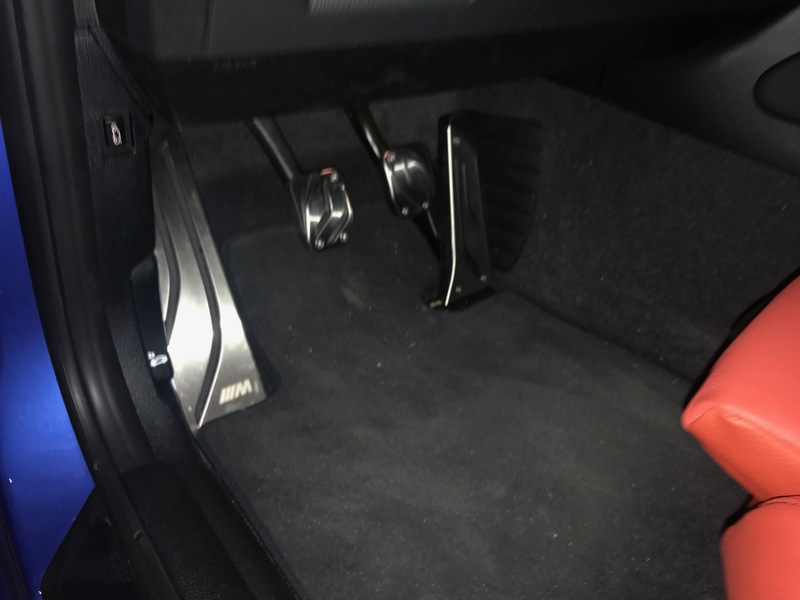 Despite the immaculate german pavement, I soon found that my optimal configuration was sport steering, sport throttle, and comfort chassis. I’ll have to play with the sport chassis more once the car is back home and I can play with it without worrying about the comfort of my passenger. 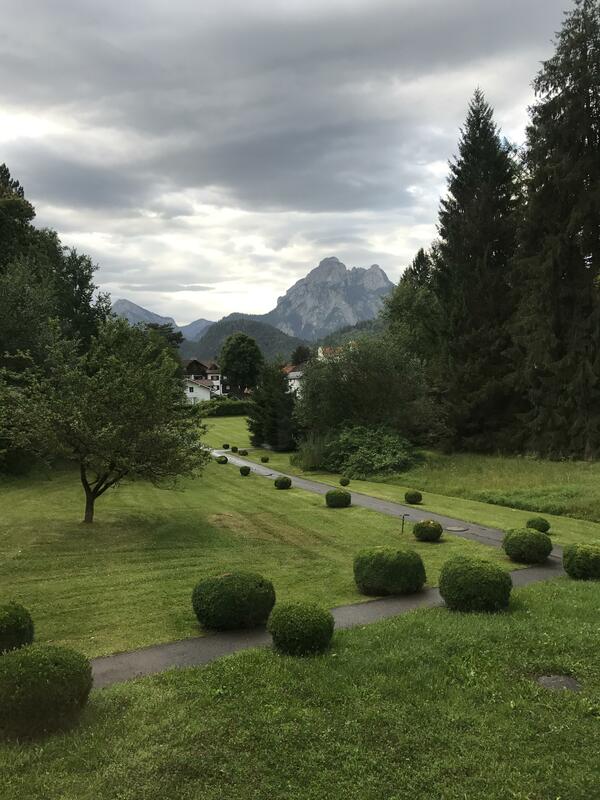 In Fussen, we stayed at a small mansion-turned-BnB called Villa Toscana (~$110). It was comfortable, parking was plentiful, and the breakfast was the first of many amazing European breakfast spreads which I still miss to this day. 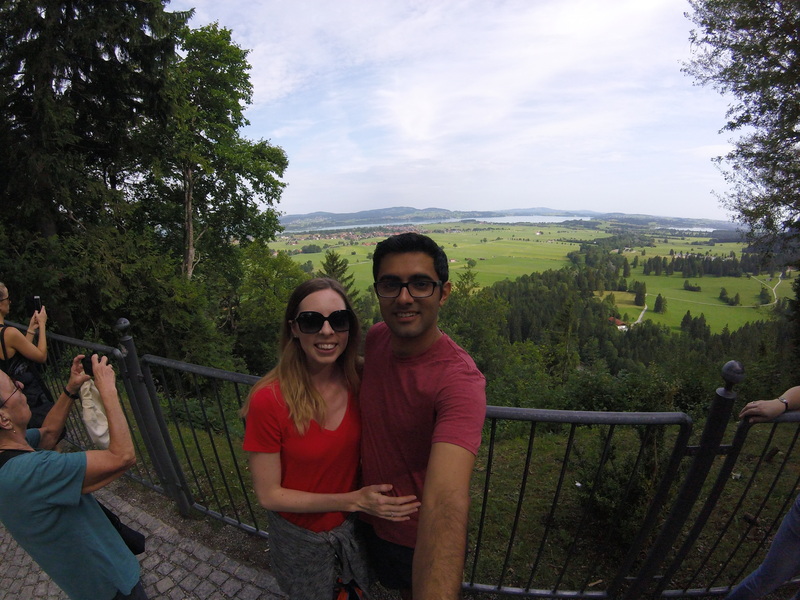 It was about a 20 minutes walk from the main part of Fussen which we walked into for dinner. The proprietor recommended a fantastic Greek restaurant which was set up in the courtyard of an old castle, which ended up being the best meal we had during the entire trip by far. As others have previously mentioned, you do have to drive a couple hundred feet down a one-way road in the wrong direction to get this photo. But it’s in the middle of open pastures so you can easily see if someone is coming, so it didn’t end up being a big deal. 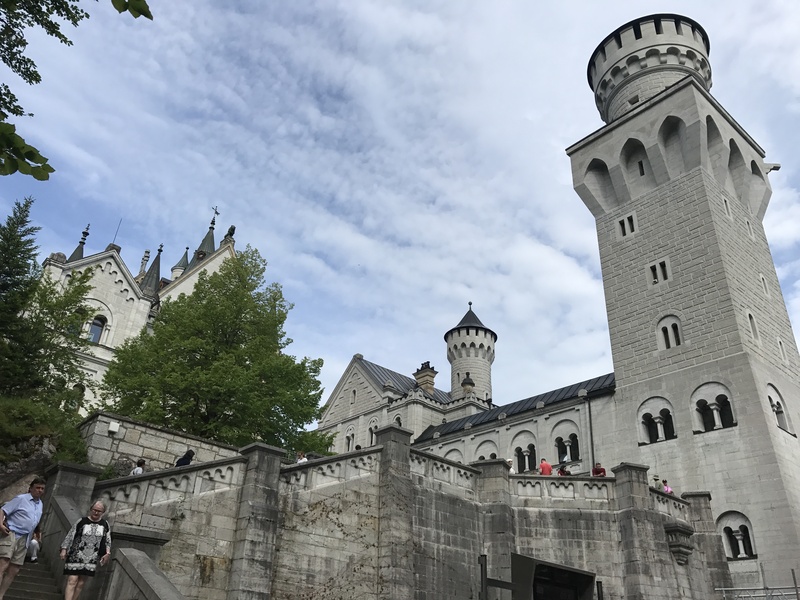 After getting about 50 different pictures at the spot, we drove a few minutes to Neuschwanstein Castle. There were throngs of tourists and tour buses everywhere, which made parking a bit of an ordeal. Eventually, we made it through all the people walking in the street and found an extremely empty parking lot, I think it was about 6 euros to park there. The weather was perfect for hiking at this time (cool and crisp around 65 degrees if I were to guess) so we skipped to long line for the shuttle and decided to hike up instead. I highly recommend this as it only took about 20 minutes or so and the path was well-traveled up a paved maintenance road. At the castle, neither of us were interested in waiting in line to go inside so we got all the pictures we wanted outside and headed back down. 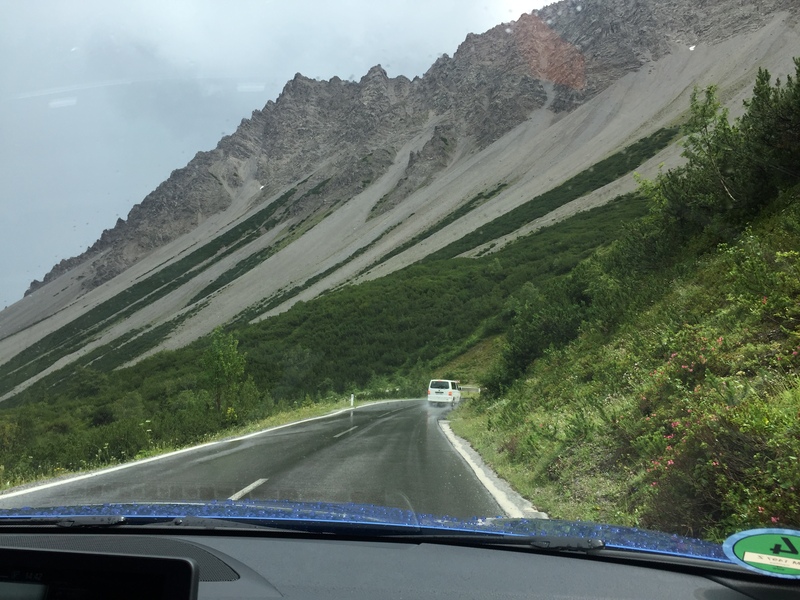 This would become a recurring trend during our trip; if we weren’t 100% intent on spending time at some place to see or do some particular thing, I leaned on the side of not seeing/doing it so that I could get back to driving my car sooner. We got back to the main road taking a slightly different path down and then oh boy! I thought it was crowded before? It was just after 10am now and there were tourists everywhere! It was at this point we decided to continue or trend of waking up early with jetlag and doing all the touristy things early because this was just a mess. 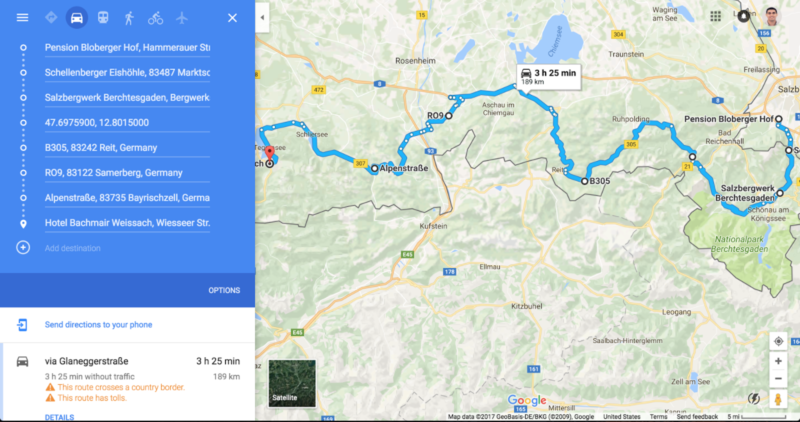 After a little maneuvering through parked tour buses we were back on the road and heading into Austria. I had purchased the vignette the previous day at the very first autobahn rest stop I saw with the vignette sign. You can’t miss them, so don’t fret about where to get vignettes before your trip. 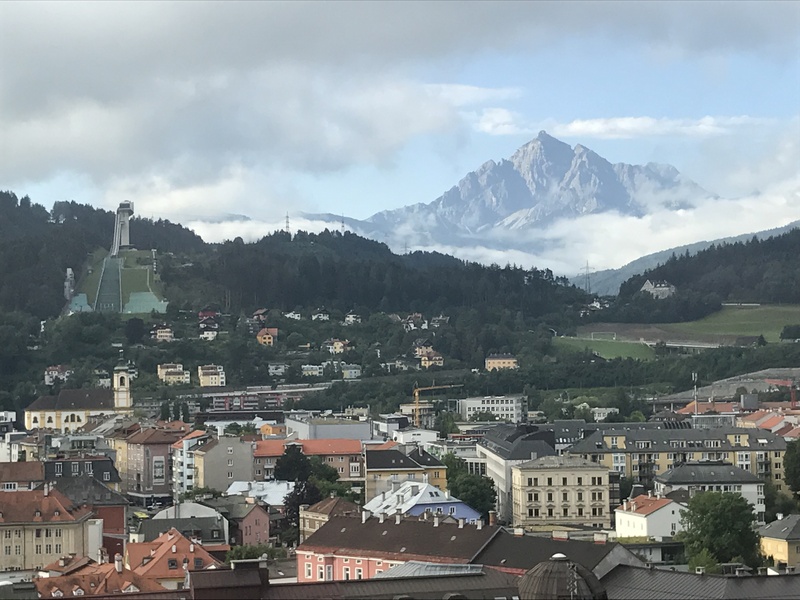 For Austria, the 10-day vignette worked perfectly for us. 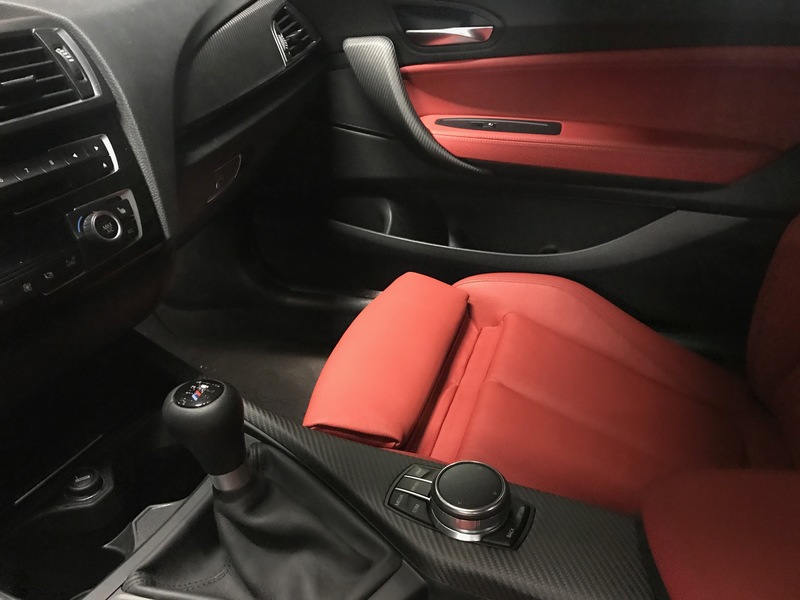 Note that there are very specific instructions on the back of the vignette regarding where to place it on the windshield and you must follow that exactly or risk getting pulled over. The A7 into Austria at this point was closed for some reason due to police activity, which gave us an excuse to take the side roads. Our next stop was just over the border at a place called Highline 179. 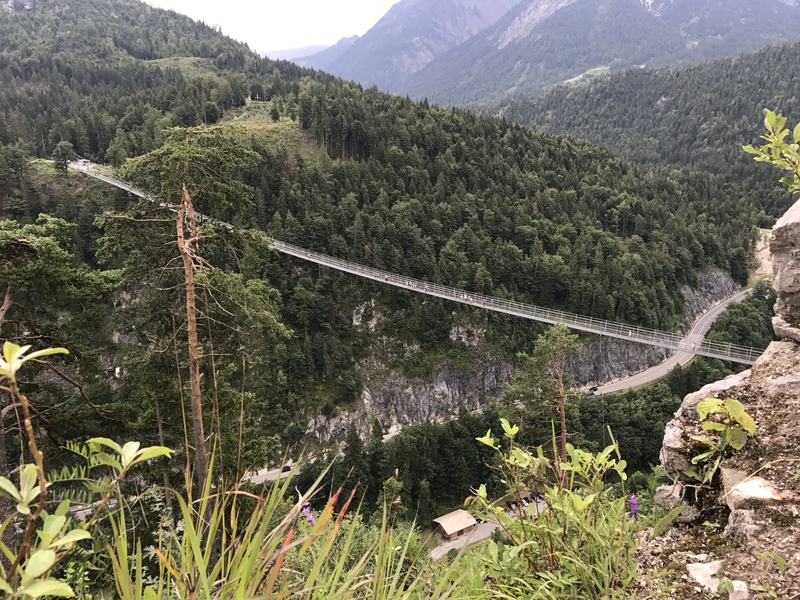 This is a very tall, very long suspension bridge over a valley with two castle ruins at each end. It was a decent hike up on each side (about 30 minutes and steep). 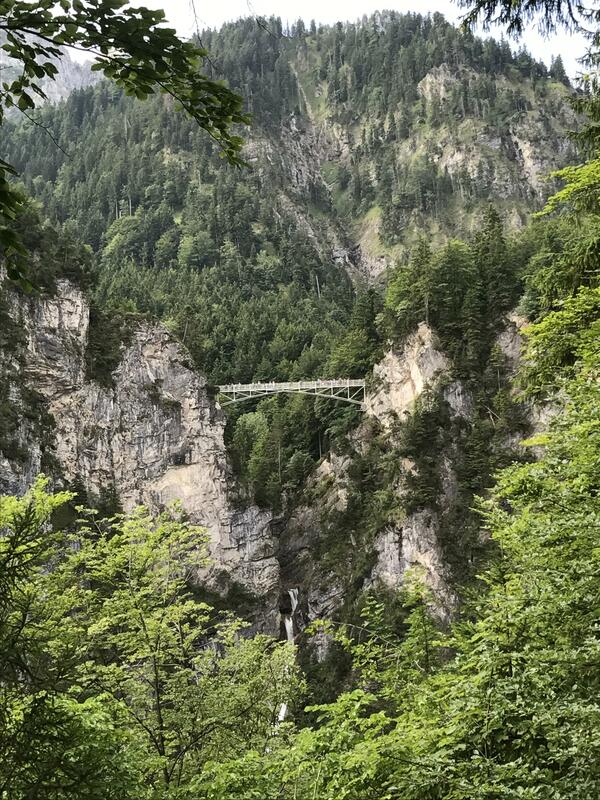 The actual suspension bridge was a bit scary at the beginning but it was much more stable in the middle. On the way down, it started to rain. A lot. 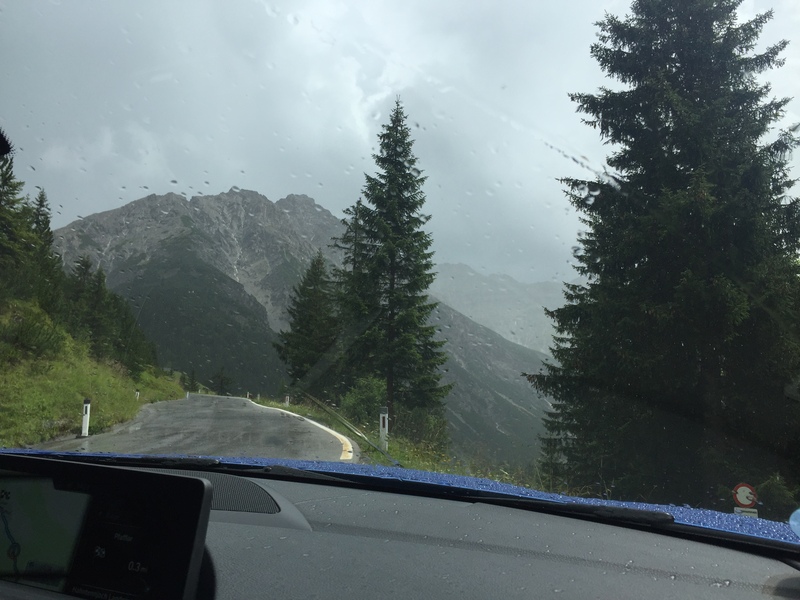 We rushed down to the car and got on the road to Innsbruck. 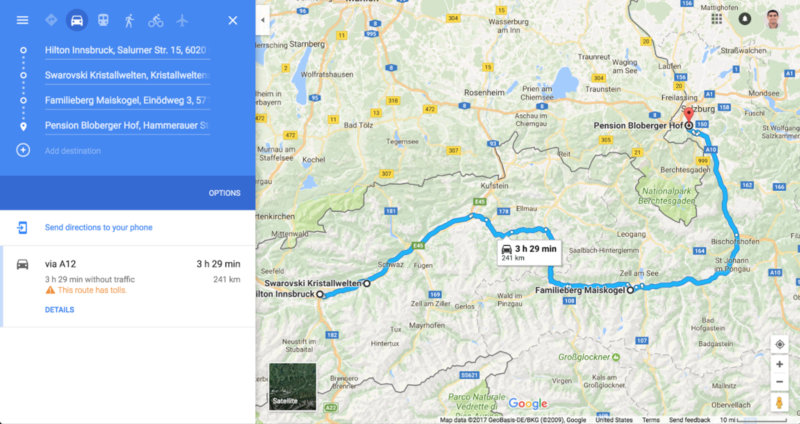 On the way to Innsbruck, I had planned a detour to drive the Hahntennjoch pass in Austria. I found this when broswing ultimatedrives.net’s “Top 10 Roads” here. The rain wasn’t showing any signs of letting up but I was determined not to miss this specifically-planned detour. When we got to the start of the pass, several motorbikes whizzed by heading up the hairpin turns. If they were still going, it must be safe, right? 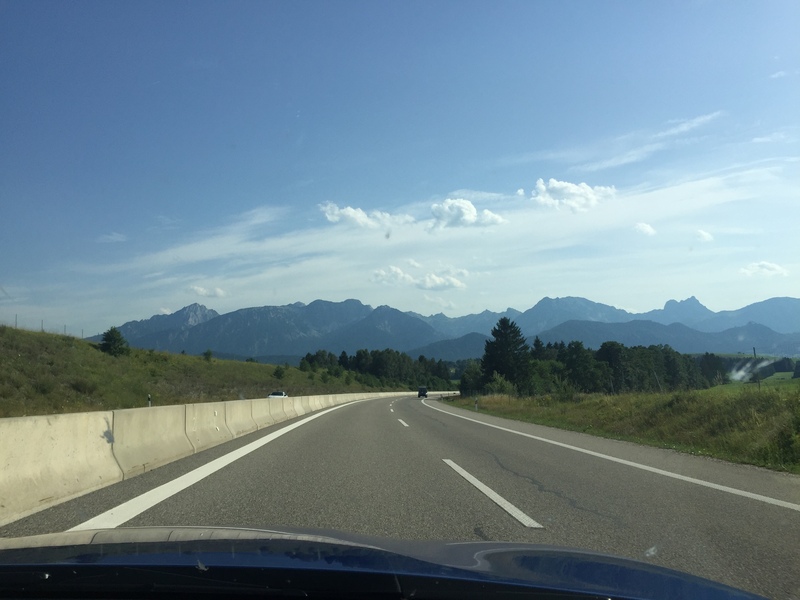 After the pass, we merged onto the Austrian autobahn and before we long we were in Innsbruck. 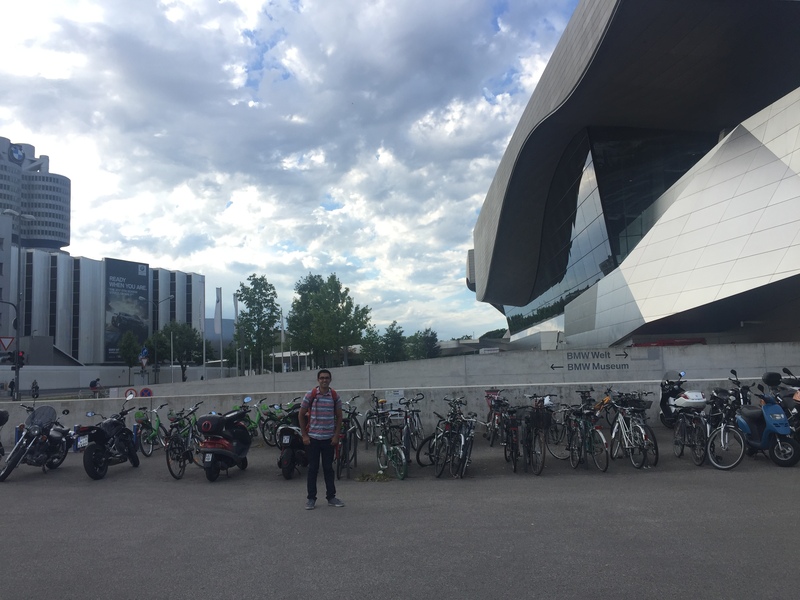 Our hotel for the night was Hilton Innsbruck, courtesy 20k or so Hilton points. 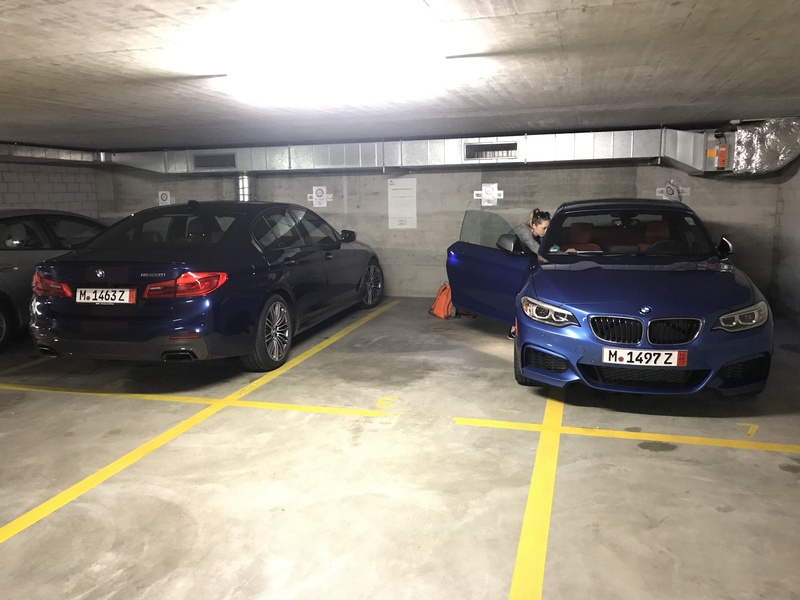 There was a gigantic, mostly empty parking lot below the hotel with several nice Porsches so I found a nice spot with walls on both sides and let the M240i take a well-earned rest for the night. Last edited by keylime503; 10-11-2017 at 12:20 AM. This was probably the day my girlfriend was most excited for. 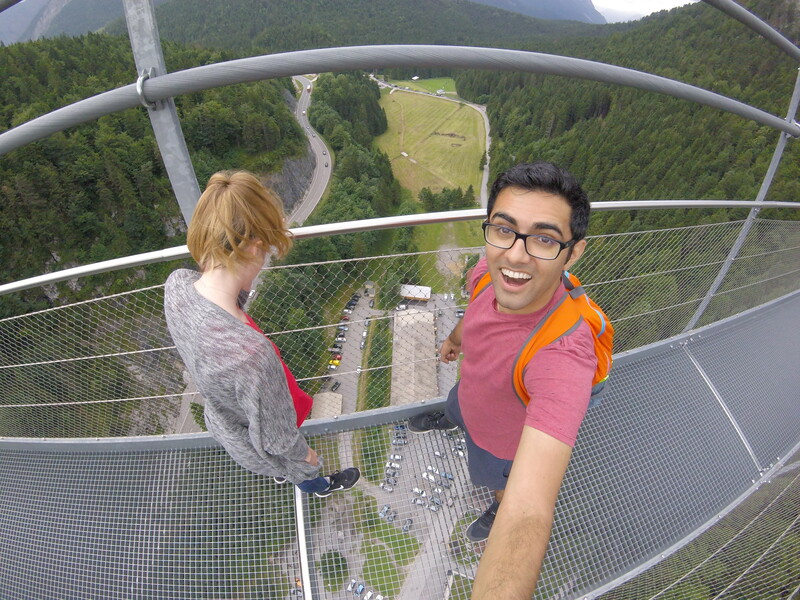 About 20 minutes east of Innsbruck is Swarovski Kristallwelten, or “Crystal World”. Her one and only ask on the trip was that we could go here and I was happy to oblige in exchange for her coming along on all these awesome non-direct driving routes between stops. 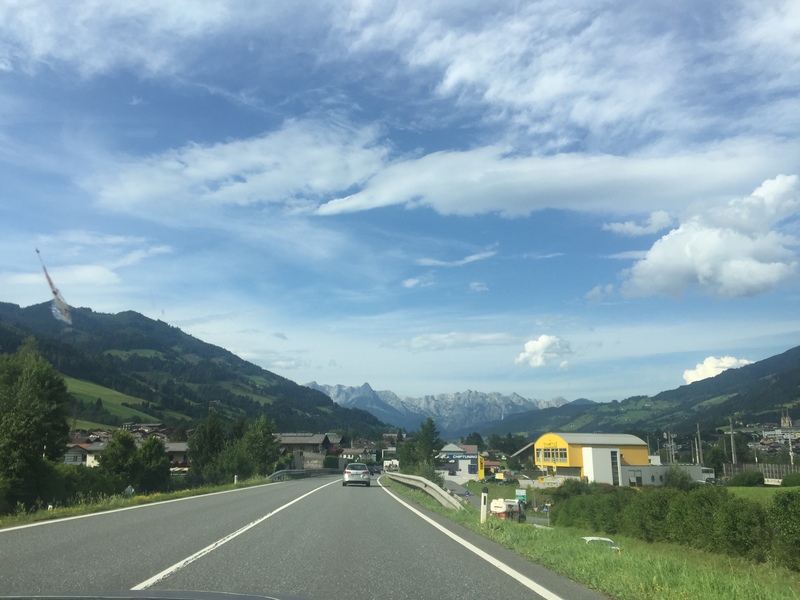 The A12 goes directly from Innsbruck to Kristallwelten but I missed the onramp and ended up taking a meandering country road that paralleled the autobahn and was absolutely AWESOME! 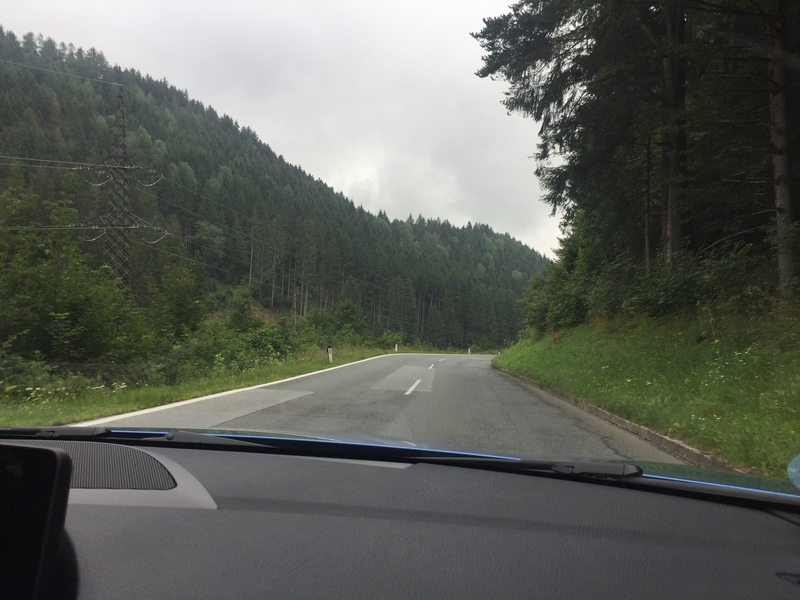 By now, I was starting to get pretty comfortable with the car and the clutch engagement point, so the gentle curves, beautiful scenery, and lack of other cars on the road had me arriving at Kristallwelten with a big smile on my face. 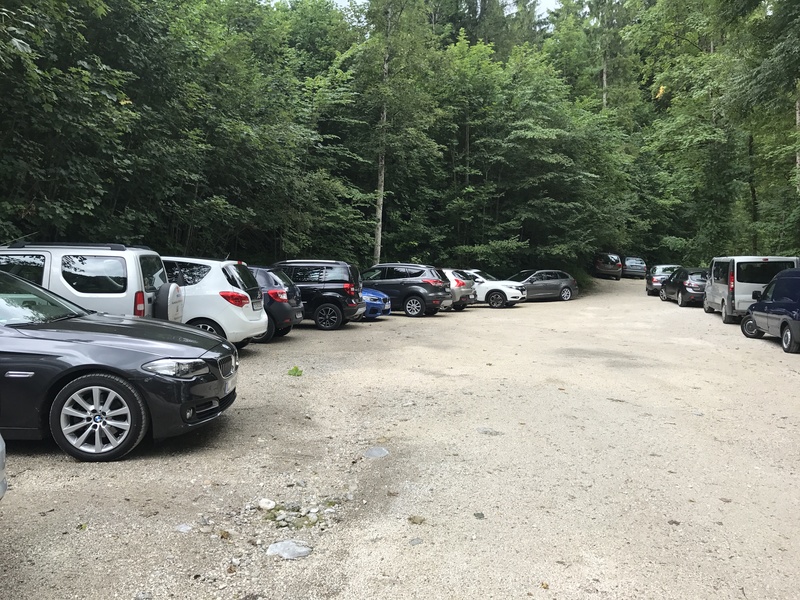 I don’t have much to say about Kristallwelten except that there is plenty of parking for the car enthusiast to be able to park far away from everyone else. Once again, it was almost empty when we arrived around 8:30am and by 10:30 when we were leaving it was starting to get pretty crowded. Note that you can ask for discount tickets at the Welt, it ends up getting you the group rate which is $2 cheaper than the general admission. The next stop for this day was at Familienberg Maiskogel. 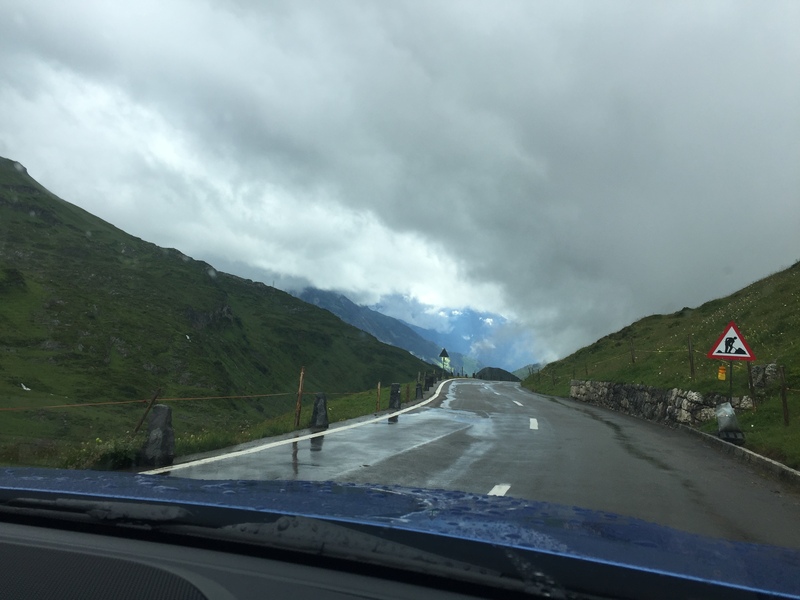 Continuing the theme for the morning, the road from Wattens to Familienberg Maiskogel was incredible. In particular, this was the drive I learned just how fast the B58 engine pulls. Seriously, it was way too easy to pass people (legally) in 3rd gear, just amazing. 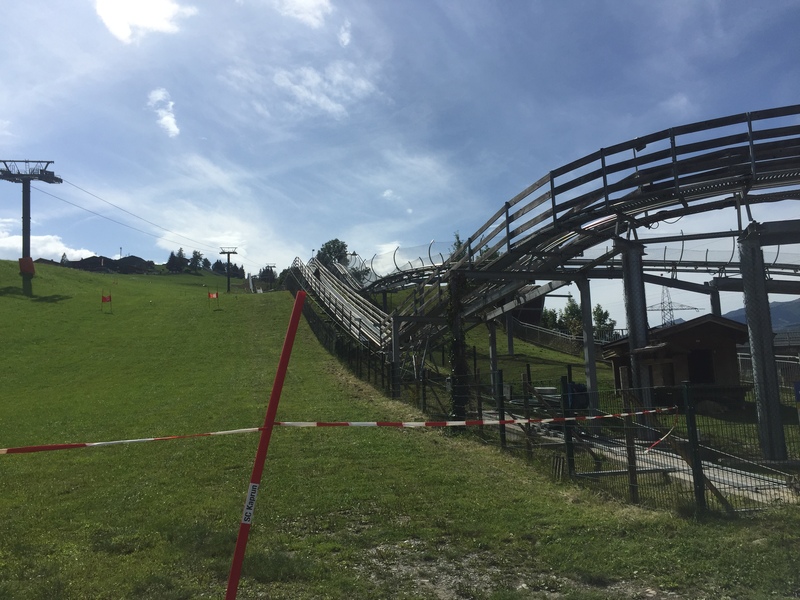 The toboggan itself was pretty fun. 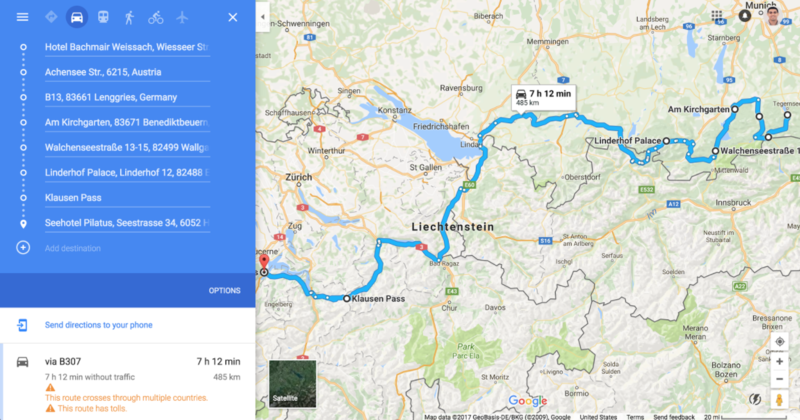 I wanted to go a second time but the girlfriend was getting tired at this point and we still had quite a ways to Salzburg. 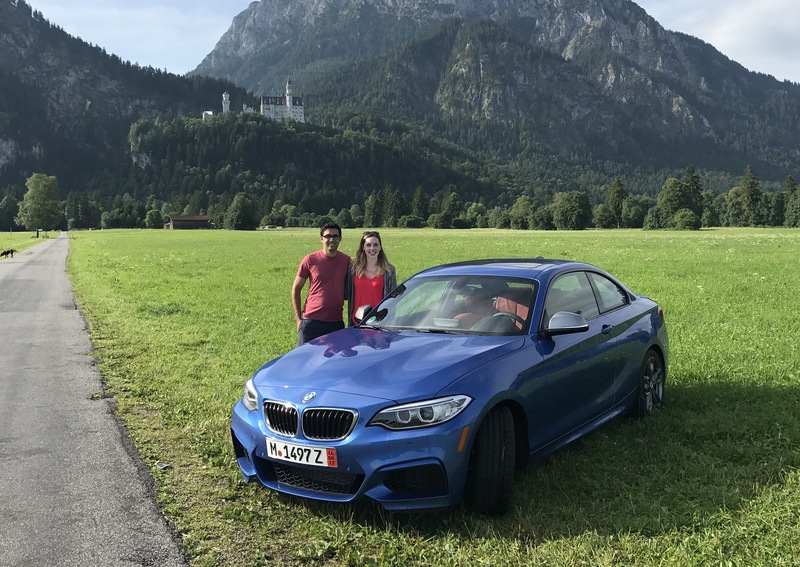 The route back to the autobahn was completely stopped due to an ill-placed roundabout that was causing a several-mile backup, so I just adopted a “take any road that goes east and we’ll eventually get around it” mentality and took off. A couple of farm roads later and we were on our way to Salzburg. 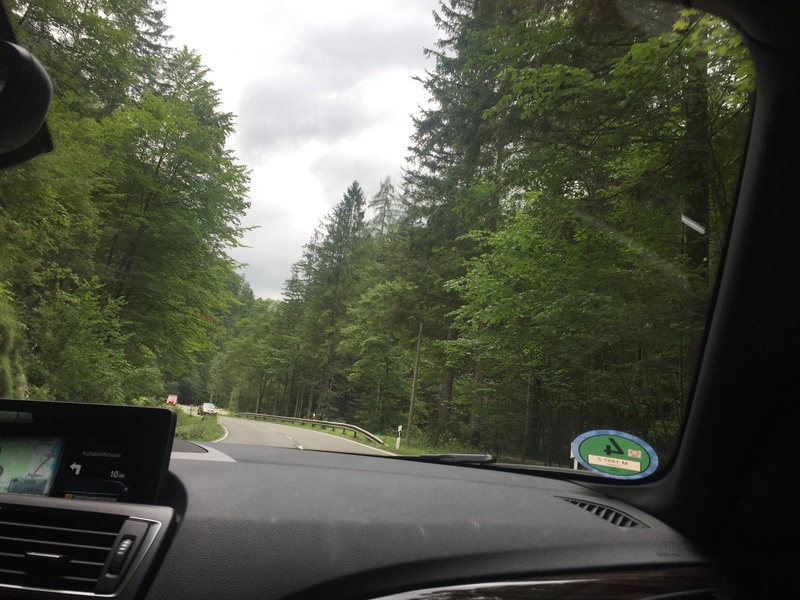 About 30 minutes outside of Salzburg the navigation system decided it didn’t want to help us get around Europe anymore and completely reset, requiring an activation code to get it running again. I had read about this before on other ED trip reports and even asked the delivery specialist at the Welt about the code in case we ran into this issue. But he was adamant that this no longer happened and we wouldn’t need it. 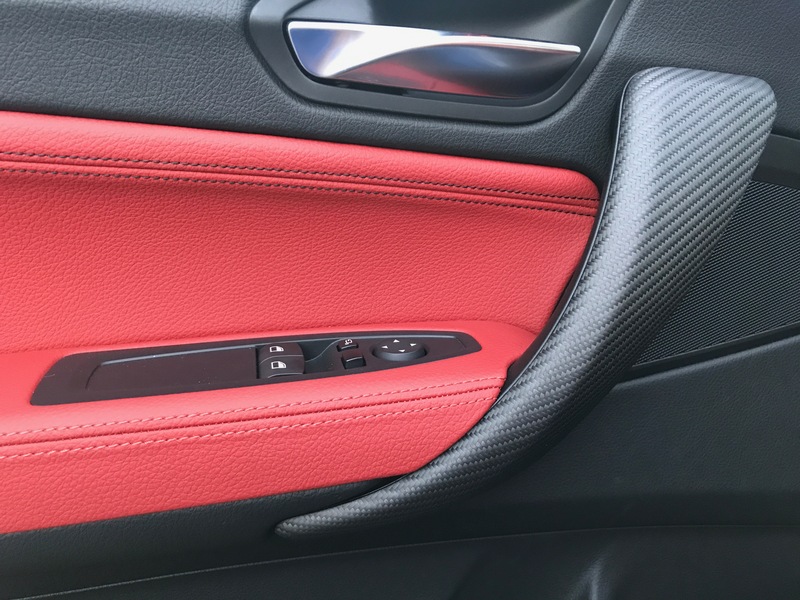 He also told us we should never ever ever remove the USB stick with the European maps from the center console but my girlfriend insisted we had no other option at this point. Sure enough, after turning the car off, removing and re-entering the USB, and restarting the car, the maps came up just fine. 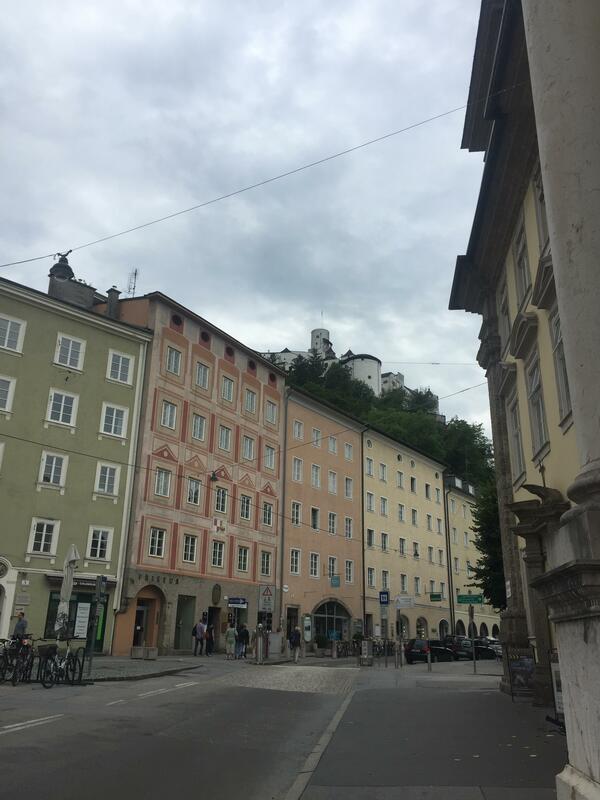 In Salzburg we stayed 2 nights at Pension Bloberger Hof. This B&B was highly recommended by many on this forum and didn’t disappoint. This was also the only place on our trip we stayed more than one night, at the exact midpoint of the trip. 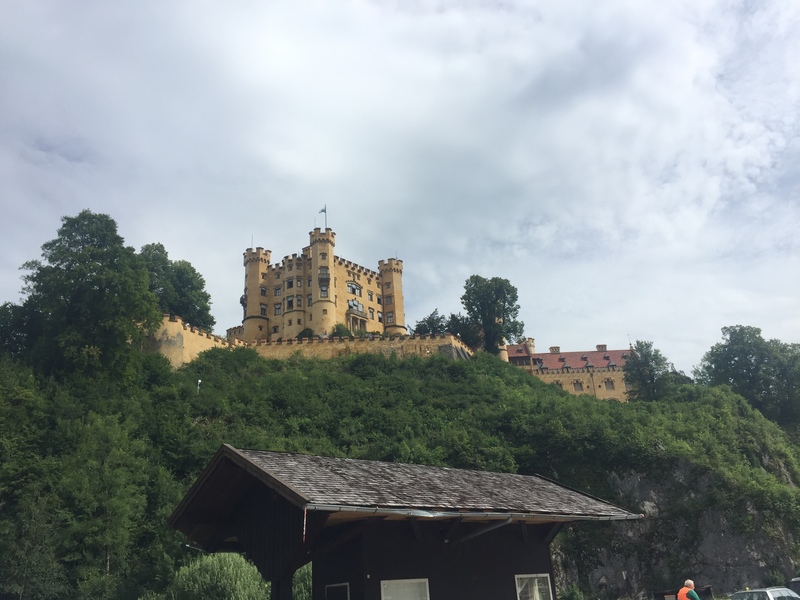 The plan for the day was Hohensalzburg Castle and Lake Hallstatt. 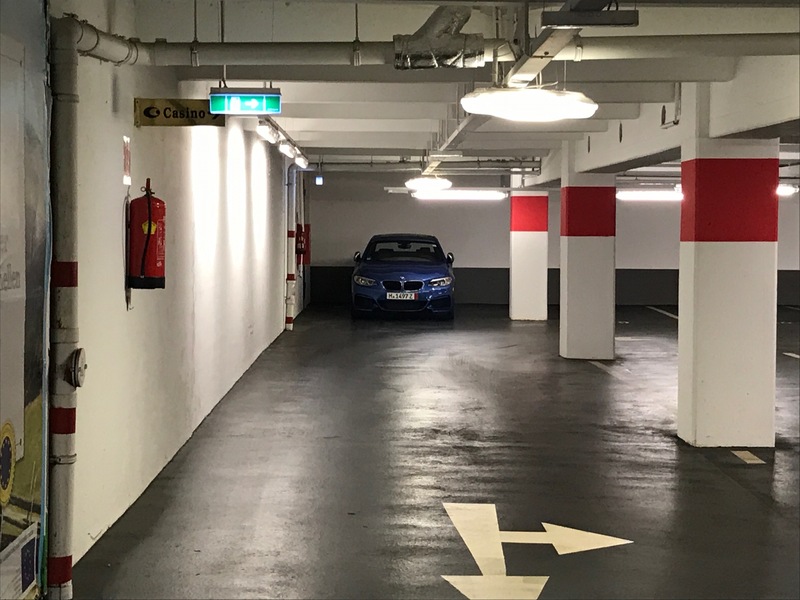 We drove into town and found a public parking garage with great end spots and a lot of other really nice cars, so I wasn’t concerned at all about leaving my car there. 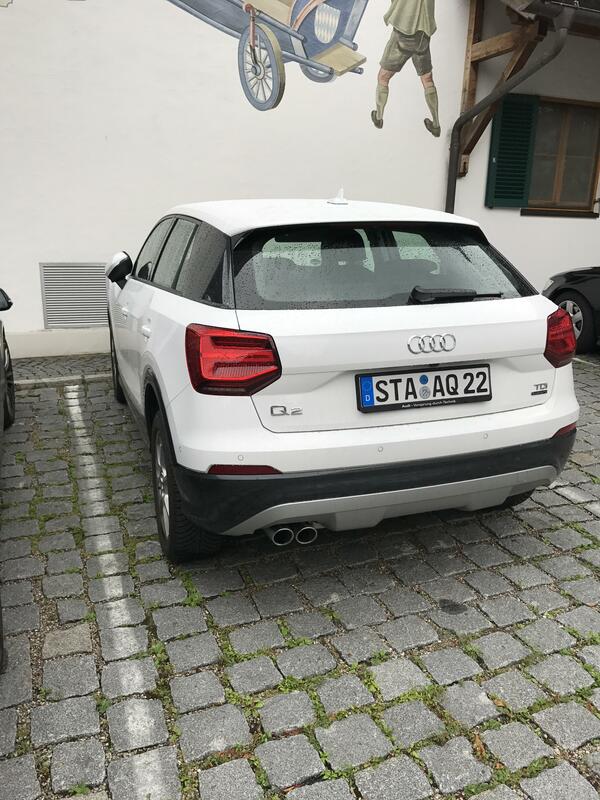 Anyone planning to drive into Salzburg on their ED shouldn’t worry a bit about parking in the city, it was very simple and safe. The parking garage I used was here. 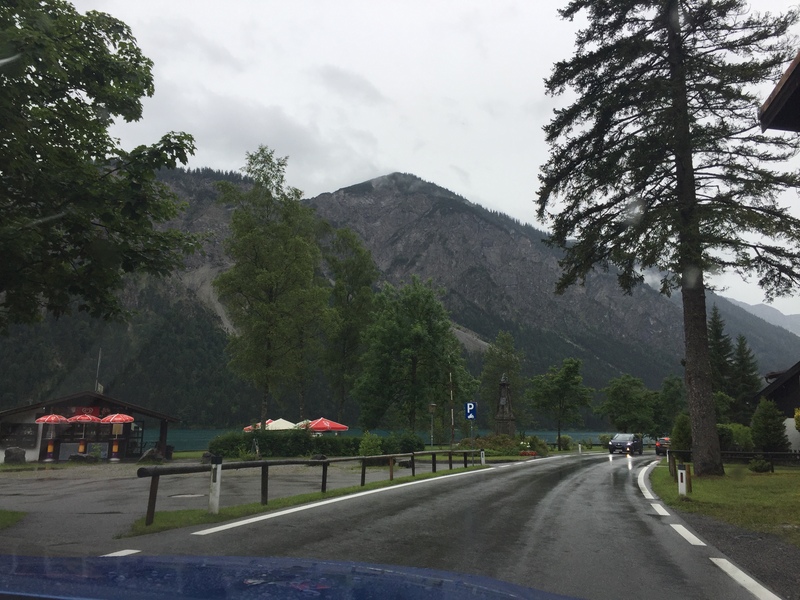 After the castle, we drove towards Lake Hallstatt which is a popular ED destination. 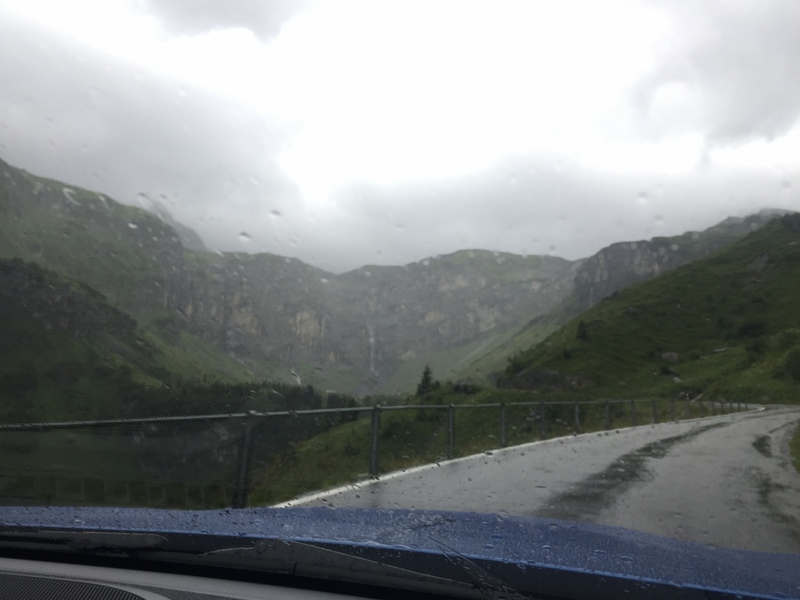 The drive to/from Hallstatt was amazing. 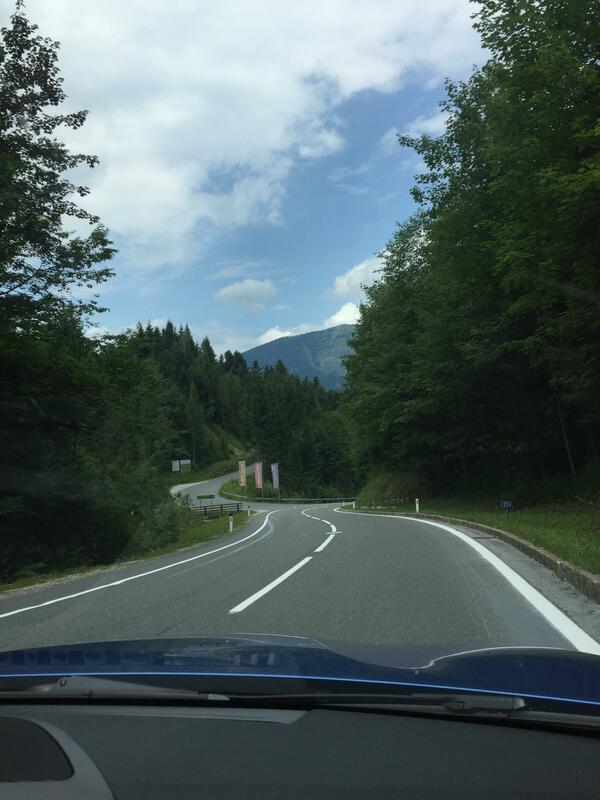 Everyone talks about the autobahn and going fast, but the Austrian backroads for me were the driving highlight of the trip. Hallstatt itself was pretty underwhelming to be honest, super touristy and crowded. One odd thing that freaked me out at first but ended up making sense was that the parking lot entry system knew exactly how many cars were in the lot at all times. This meant that when the lot was full (as it was when I drove up), the entry gate would not open until a car comes out the exit gate. So we ended up waiting at the entry gate for about 10-12 minutes (after freaking out and pressing the help button to no avail). 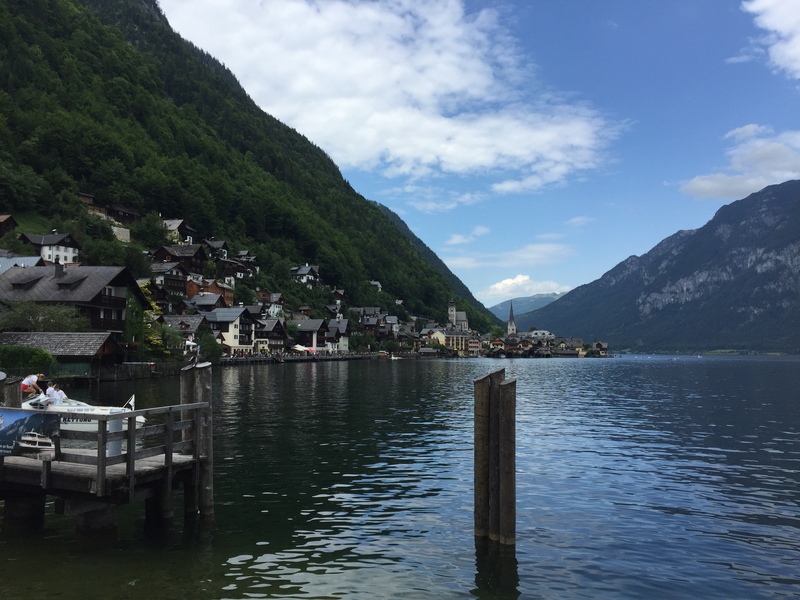 We walked into Hallstatt to take some pictures and get lunch on the water. As touristy as the place was, I was really surprised to find a restaurant on the water for under 10 euros per person. 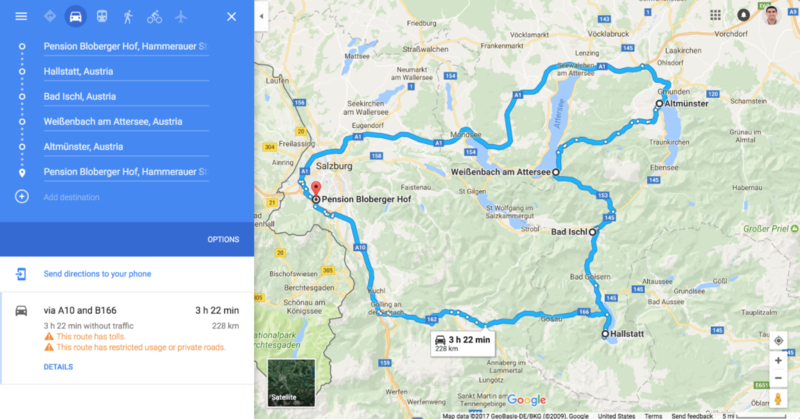 If you’re like us and get bored quickly of super touristy places, you might want to skip Hallstatt and just drive to/from it instead. 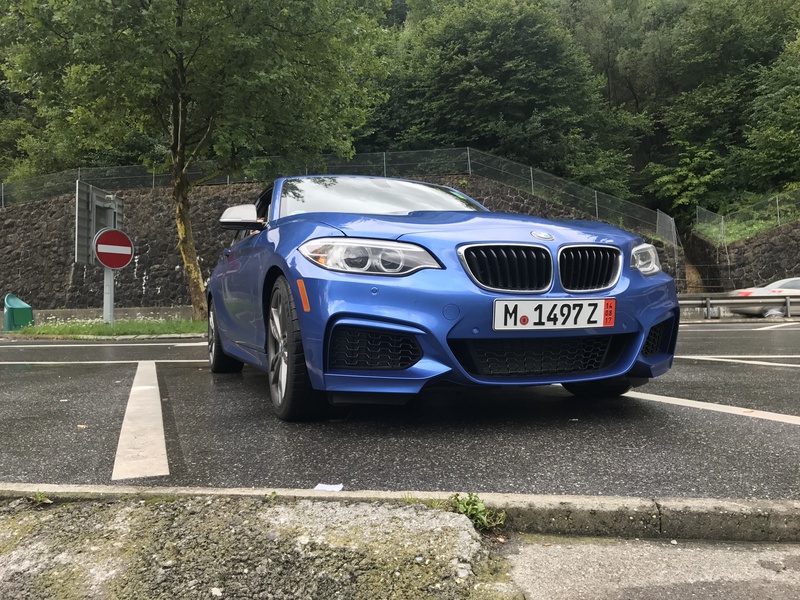 On the way back to Salzburg we followed the guidance of someone on the forums who had recommended two specific “made-for-M-cars” roads around some lakes north of Hallstatt. The second lake we came upon was gorgeous, we saw tons of locals walking across the road with picnic gear and beach toys. We even saw a family with a butler who was carrying all their gear for them! Needless to say, we figured it was a wealthy area. 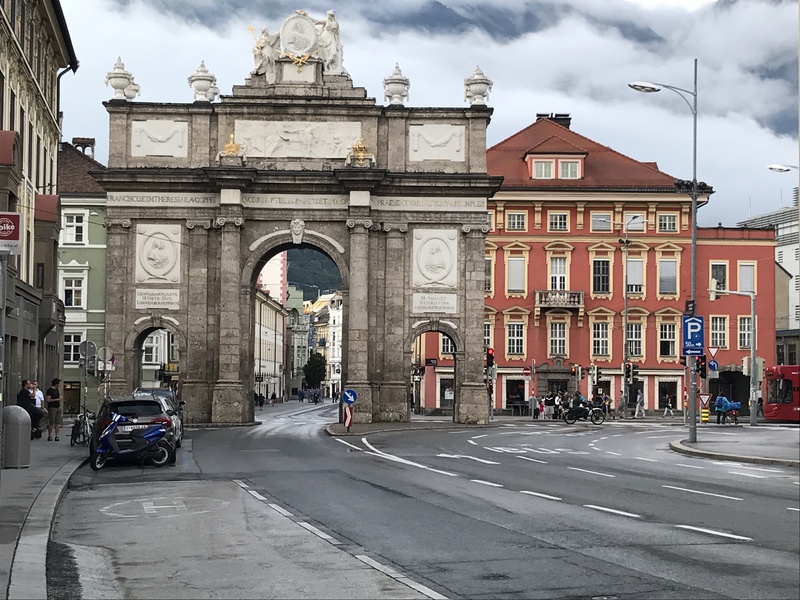 Back in Salzburg, we headed to the same parking garage we used in the morning and headed into town for dinner and drinks. The downtown area was really picking up at this time and the ambiance was wonderful. 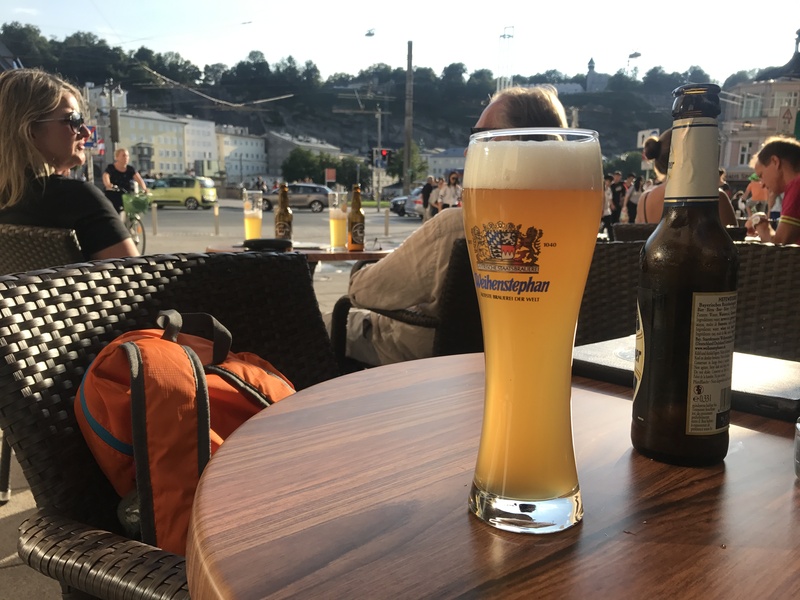 I highly recommend taking one night and walking around the main Salzburg area and sampling the various outdoor bars and cafes. Last edited by keylime503; 10-11-2017 at 12:19 AM. 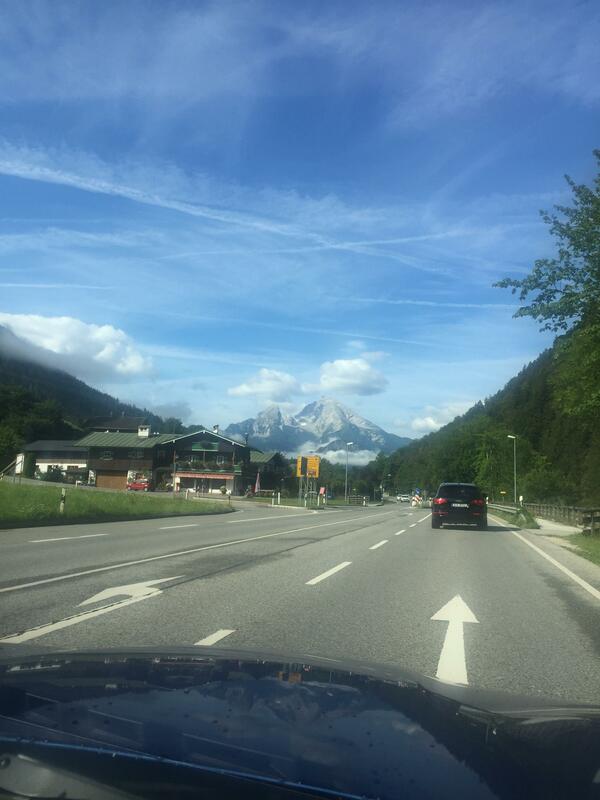 Today was all about the Alpenstrasse, also known as the German High Alpine Road. 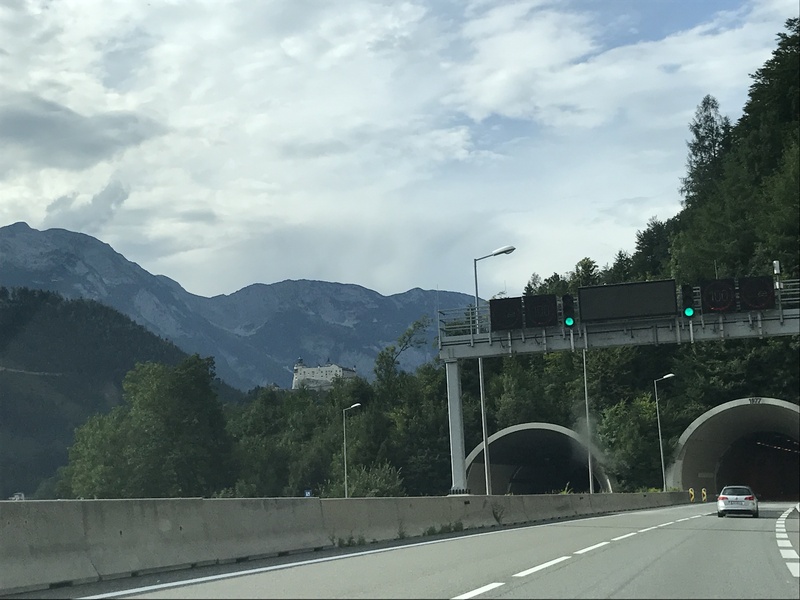 Our first stop was back in Germany at the Salzbergwerk Berchtesgaden salt mines. We had pre-reserved a specific tour at a specific time online in advance but it seemed like you could just walk up and buy tickets for the next tour. When you’re driving here, ignore the navigation and follow the parking signs on the road. I ended up parking in the employee lot by accident because I had put in GPS coordinates for the salt mine and that’s where it took me. The salt mine tour was really cool. 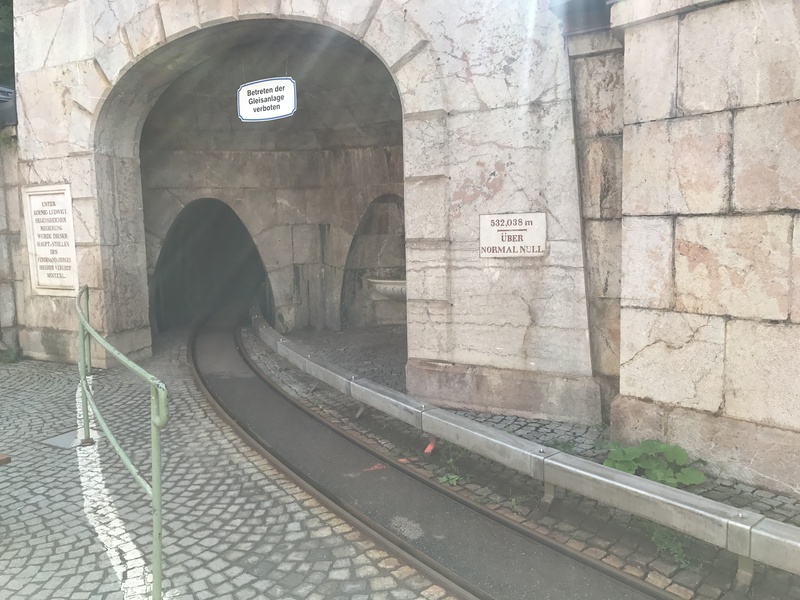 There was some interesting learning combined with some fun wooden slides and an underground train ride, definitely worth the stop. 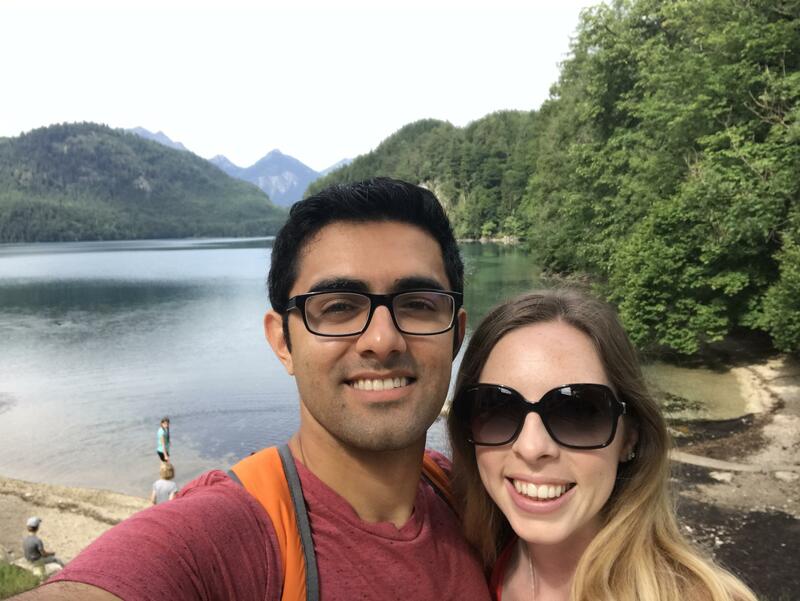 Our next stop was Lake Konigssee. Even from afar the traffic was really starting to build up and having already seen a bunch of beautiful lakes the previous day, we decided to audible and skip this stop. 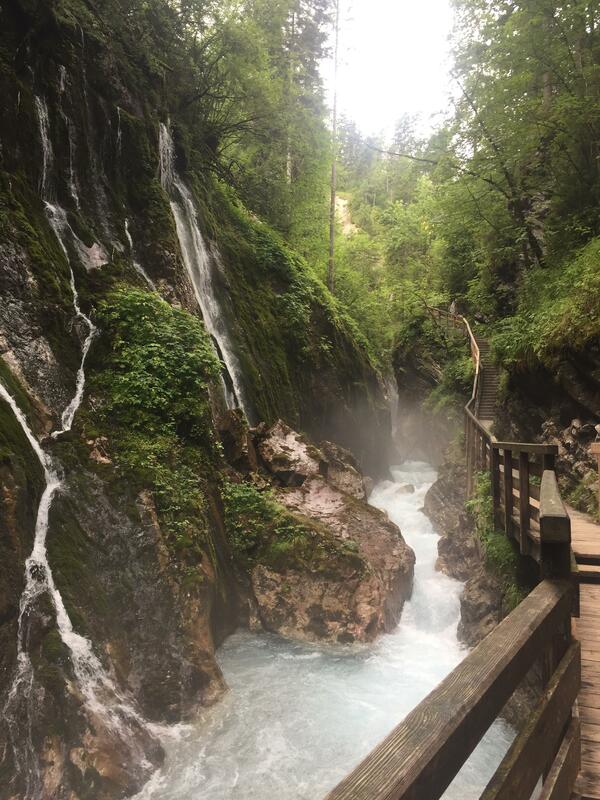 The previous night, I stumbled upon a cool gorge hike along the Alpenstrasse that was supposed to have a ton of waterfalls and only required about a 20-30 minute hike up to the start. I drove by the turnoff twice before spotting it, this was definitely more of a roadside hike for locals than a tourist trap! It took a couple of laps around the parking area before we found a spot in the dirt lot in the back. 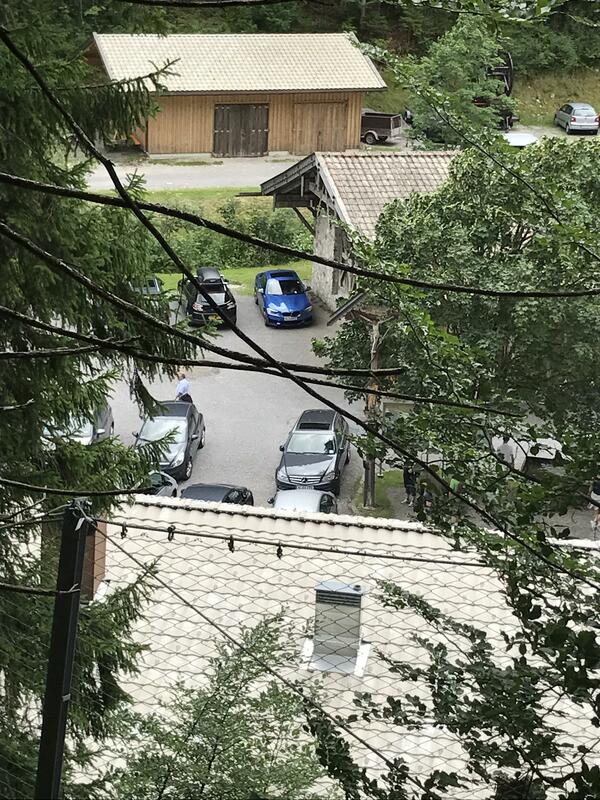 Notice how much a blue car stands out in this picture! 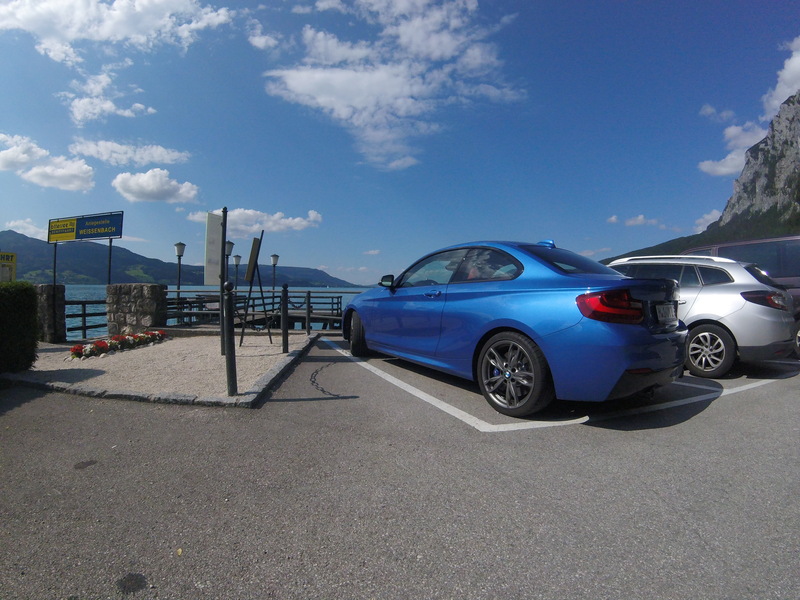 This was a common trend throughout the trip, I was really surprised to see how most other cars in Europe were greyscale. The older gentleman in the shack at the bottom of the trail only sold sparkling water and it was getting hot so to be safe we decided bubbly water > no water. After about a 20 minute walk uphill, you come across a random token machine where you have to buy tokens to access the gorge. Make sure not to miss this because there is no token machine at the actual gorge entrance. 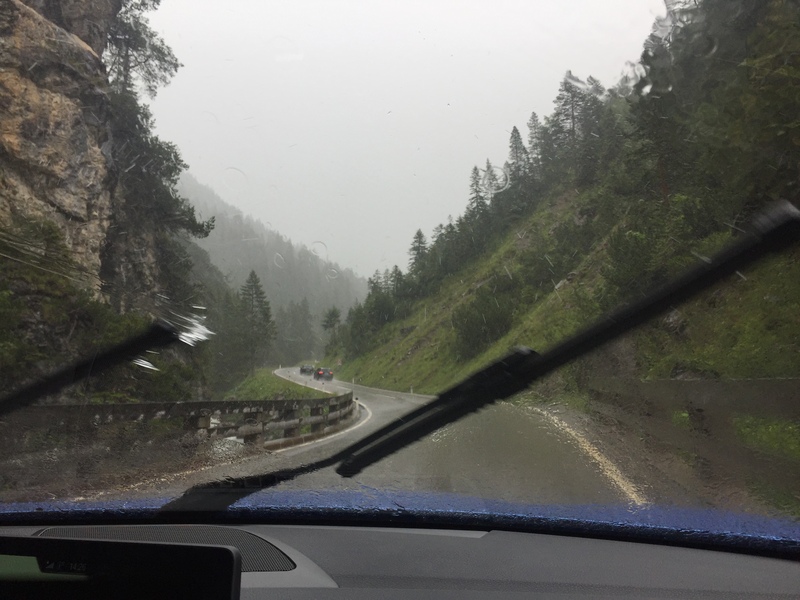 Back on the road on the Alpenstrasse it was starting to rain and the new windshield wipers were getting a full workout. Good thing they were up to the task, because from this moment it rained for the rest of our time in Europe. Our stop for the night was this awesome SPG Design Hotel called Hotel Bachmair Weissach on Lake Tegernsee. I used only 12,000 SPG points for this 5-star hotel that runs $400+ per night, crazy steal! For some reason, we also got upgraded to a 1-bedroom suite so it’s really a shame we were only using this hotel as a place to crash along the Alpenstrasse instead of spending more time here. Before leaving, I had to snap some quick photos for a couple of really unique cars I saw in the hotel parking lot. 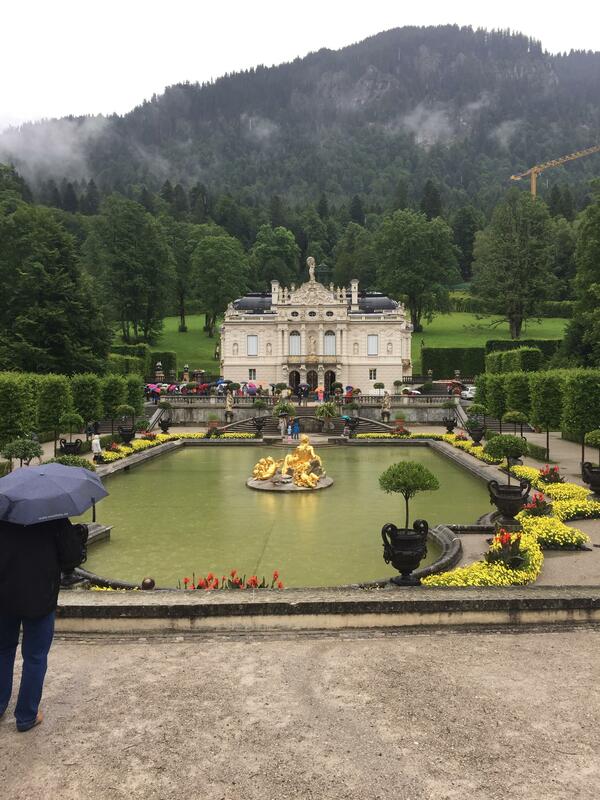 The first stop was Linderhof Palace, again along the Alpenstrasse. The rain didn’t let up one bit by the time we got there so we busted out our plastic ponchos for the 15-20 minute walk to the main palace. After a couple of photos the rain was really starting to come down hard so we headed back to the car and got back on the road. 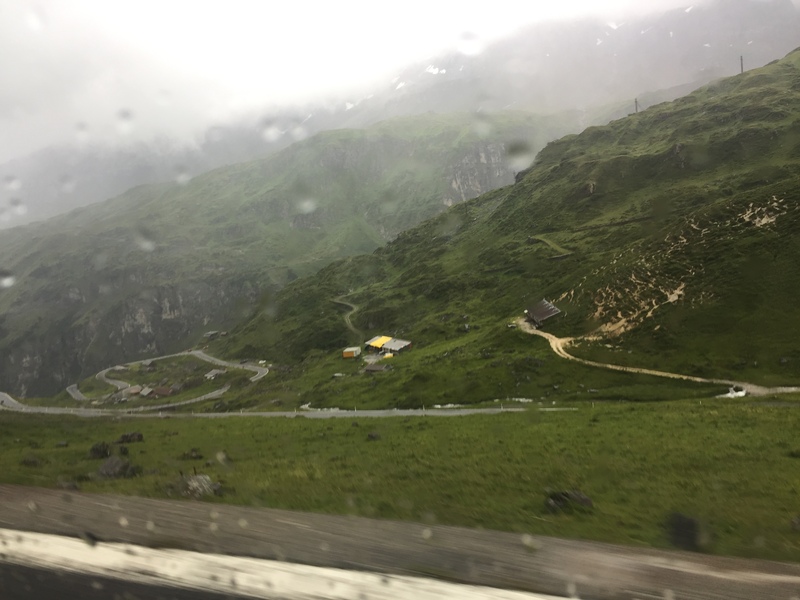 At this point, the desire to finish the Alpenstrasse was quickly fading in favor of making it to Klausen Pass in Switzerland before nightfall. 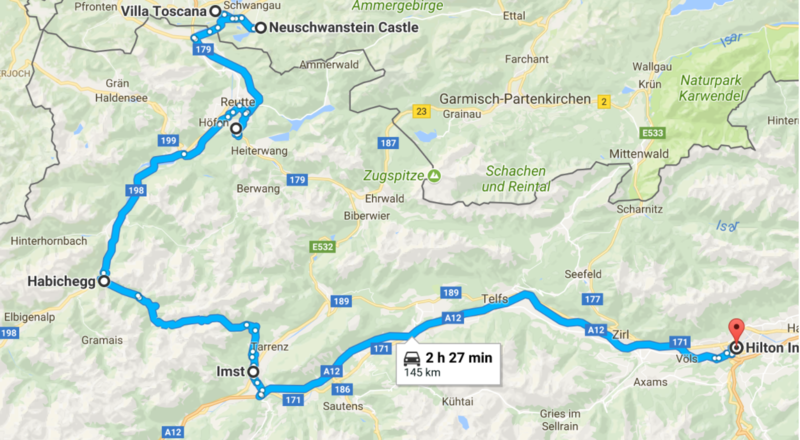 So I just the navigation for the start point of Klausen Pass by the most direct route which ended up as Germany -> Austria -> Germany -> Austria -> Switzerland, so many border crossings! 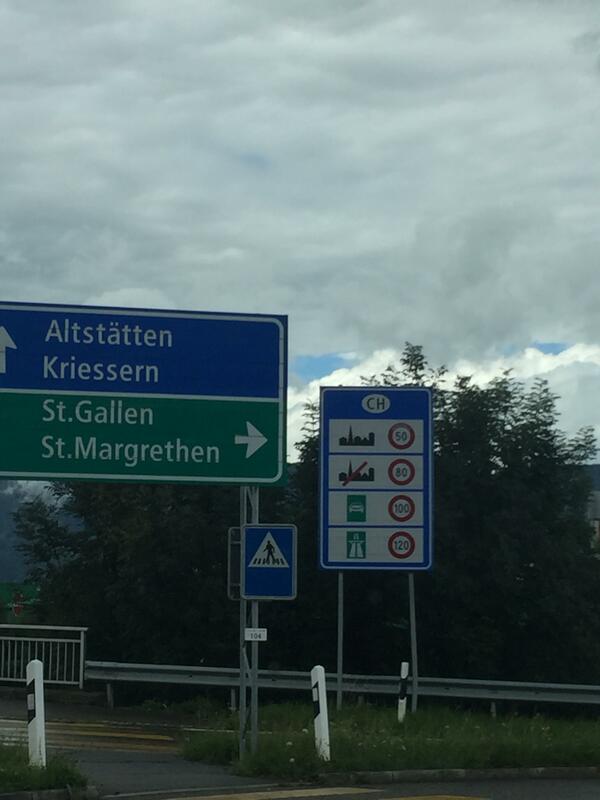 One common thing I read about going to Switzerland on ED was that the Swiss take their speed limits very seriously. Sure enough it seemed like everyone was driving exactly the speed limit (which is only 80 kph on back roads!) 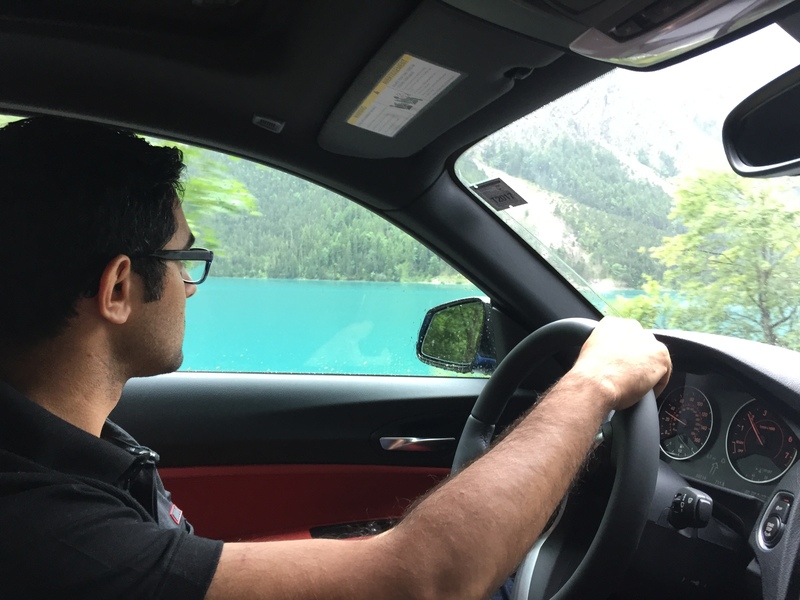 which became quite a bore after the awesomeness of driving in Germany and Austria. 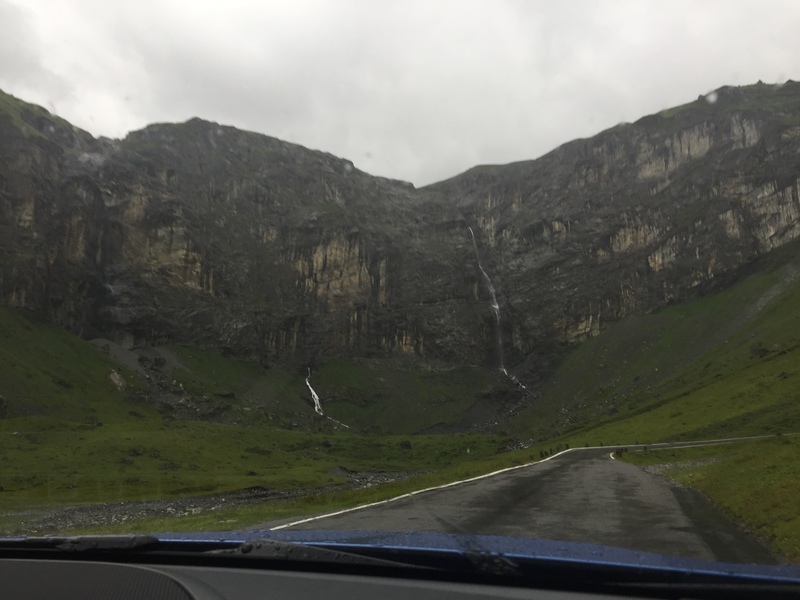 Eventually, we arrived at the start of Klausen Pass. On the plus side, it was still light outside! Bad news: Still pouring rain. Oh well, here we go! 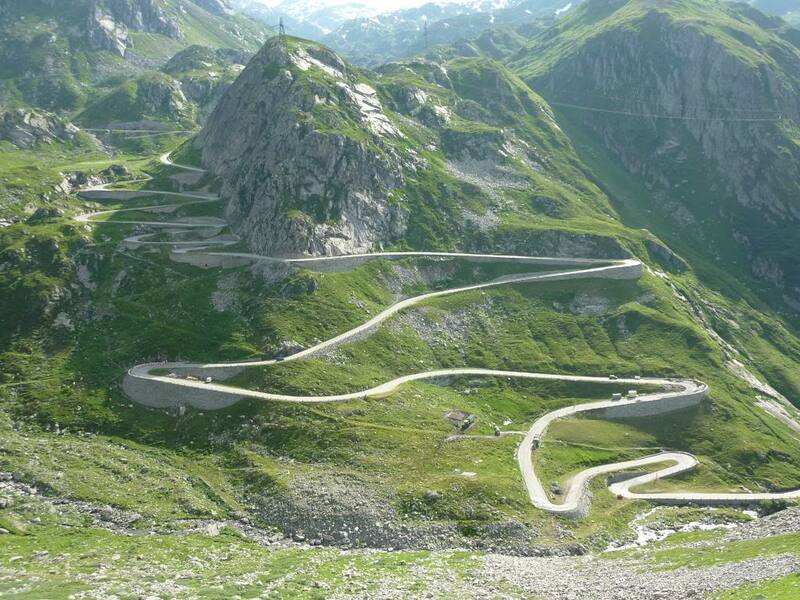 If you like 1st gear hairpins and jaw-dropping elevation change, this alpine pass is for you. Without a doubt this was the most epic driving road I’ve ever been on, and 100% worth the detour. I originally picked it because reviews said there is almost never any traffic on it, and sure enough I could count on one hand the number of cars we passed over the entire pass. 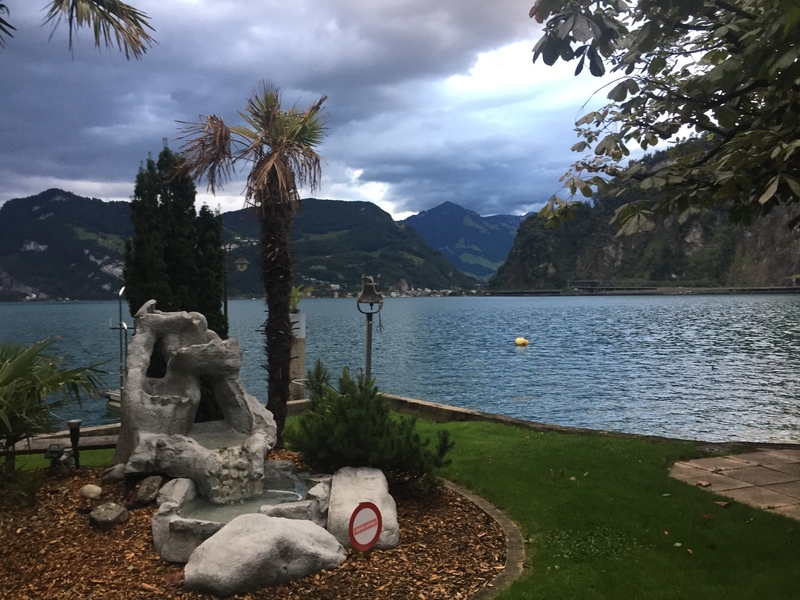 We spent the night in a town called Hergiswil on the shores of Lake Lucerne. 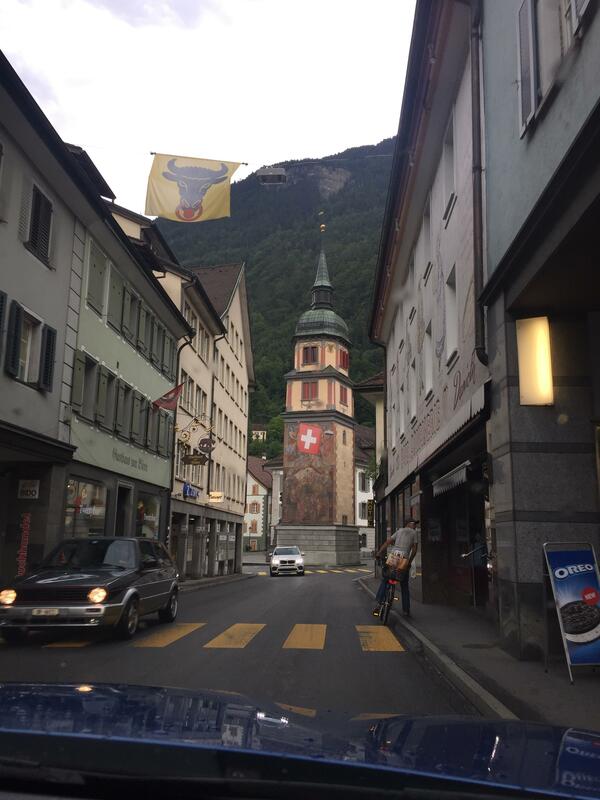 If you’ve never been to Switzerland before, be advised that everything (especially food) is really expensive. 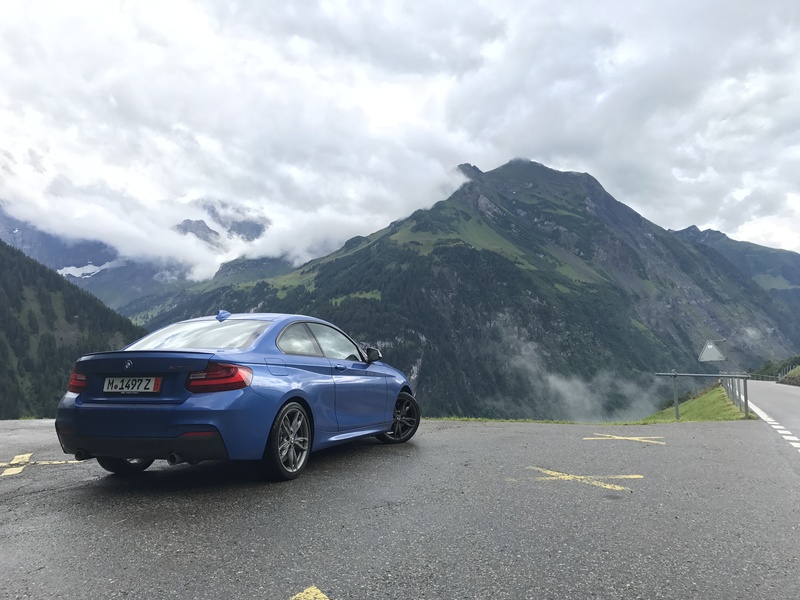 When you add that to the ~40 euro 1-year vignette (there is no shorter option) and strictly-enforced low speed limits, I would honestly recommend skipping Switzerland on your ED. And yes, I know I was just raving about the Klasen Pass. That just shows how much the vignette cost, food cost, and speed limit issue was a negative for me. Last edited by keylime503; 10-11-2017 at 04:54 PM. Just as I was starting to get super comfortable with this car, today was the day we had to say goodbye. Our flight out of Zurich wasn’t until 5pm but the drop off company told us we needed to drop the car off at 1:30 to make our flight! 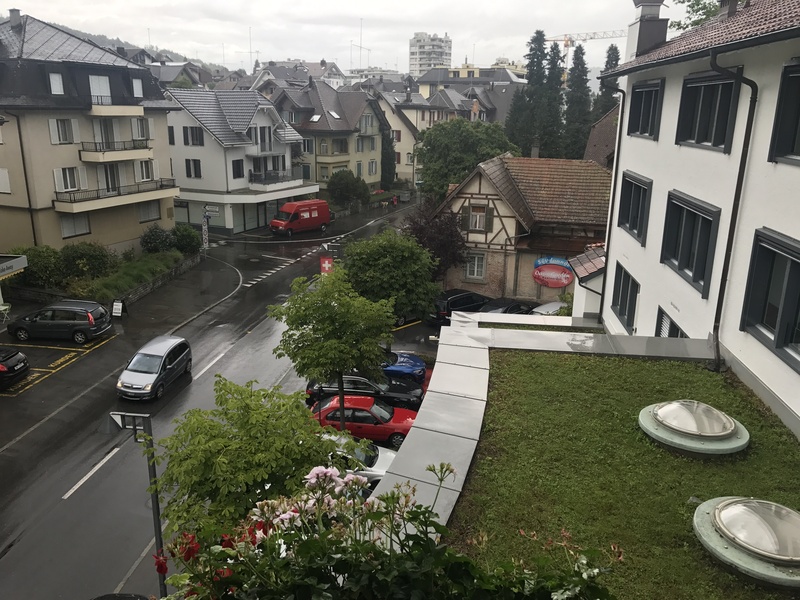 Since Zurich was about 1 hour away from Lucerne, the plan for today was to drive to Zurich, find a car wash, and then drop off the car. 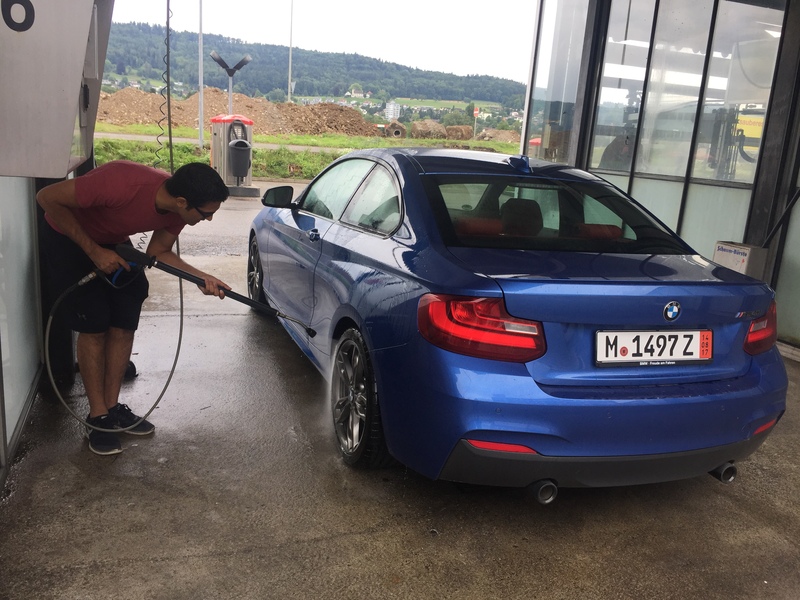 Despite the drop off company telling me that self-service car washes were nearly impossible to find in Switzerland anymore, I discovered the AutoP chain of full and self-service car washes in the Zurich area. I actually planned out the route to 3 different locations because I was worried there would be a wait or I wouldn’t be able to figure out how to operate the self-wash bays without speaking the language. Turns out that was completely unnecessary. The first AutoP location we went to had about 12 self-wash bays and there was only one other customer. The fact that it was still raining probably helped. Google Translate really came in clutch here while using the token machine, and before long the car was sparkling clean again. 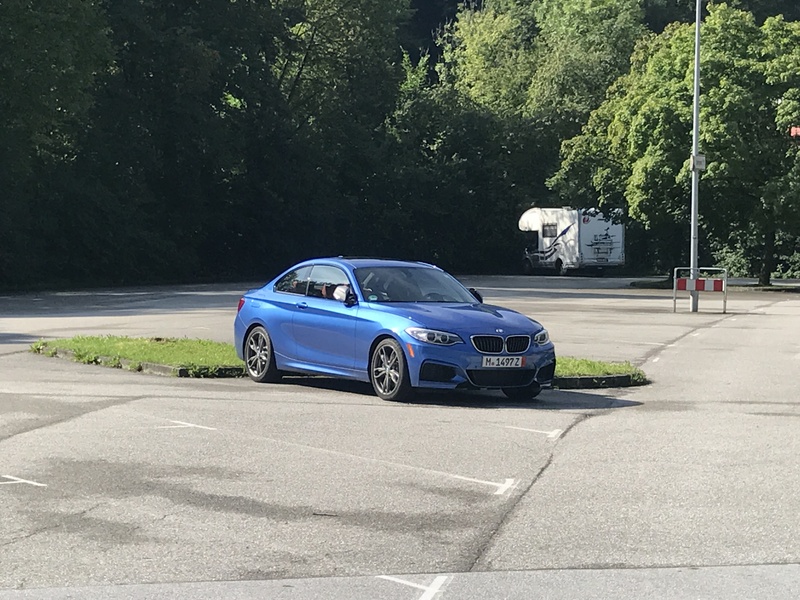 I can’t overstate how much I love Estoril Blue II, it looks so different depending on the lighting and always draws stares from surrounding cars. After washing the car we still had about an hour to kill before our drop off appointment. Being in an industrial area behind Zurich airport there weren’t a lot of food options so we ended up at a Burger King believe it or not. We ordered two burgers, two fries, and a drink, and it came out to over $30 USD!!! Did I mention food in Switzerland was crazy expensive? The flight to Manchester was uneventful as was our overnight stay there. 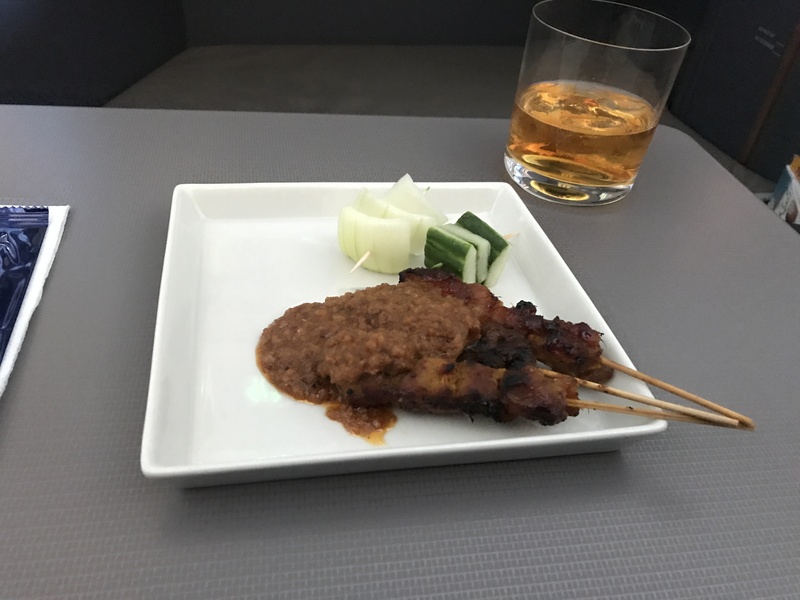 If Manchester seems like a strange stop on the way back from Zurich it was because I wanted to fly Singapore Airlines’ 5th freedom Manchester -> Houston route on the A350 and the miles redemption worked out perfectly there. If you made it this far, thanks for reading! Stay tuned for updates on how long it takes for redelivery stateside. 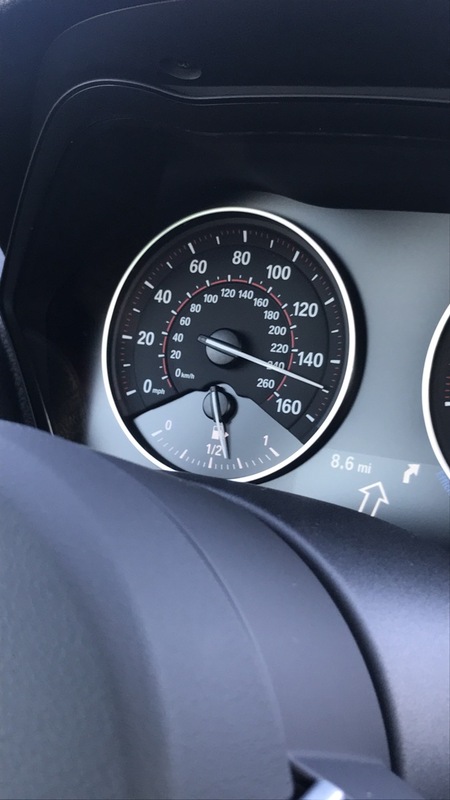 Did the factory folks tell you to keep the speeds under 100mph and the engine speeds under 4500rpm for the first 1200 miles? 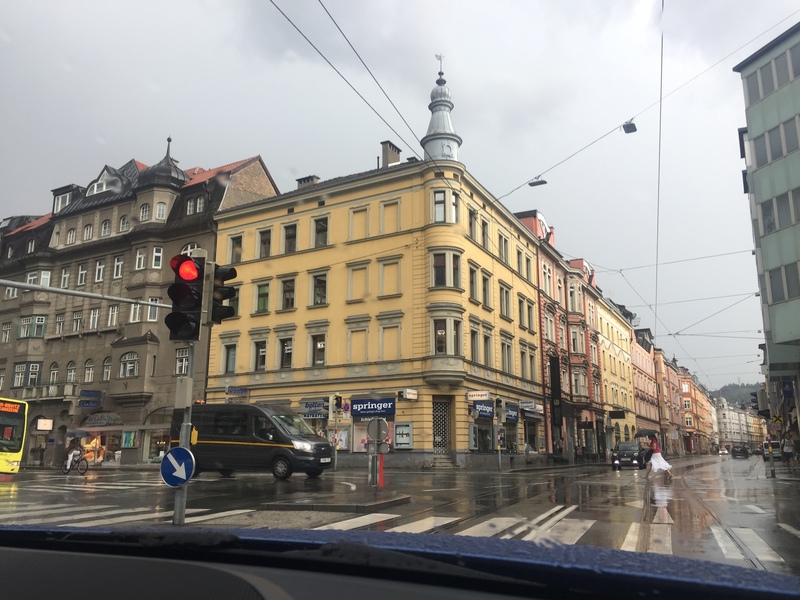 I dropped off the car in Zurich on July 25th. Using the W&W ship schedules for Bremerhaven -> Port Hueneme here, I knew that the W&W ship options coming up were leaving on August 1st and August 10th. 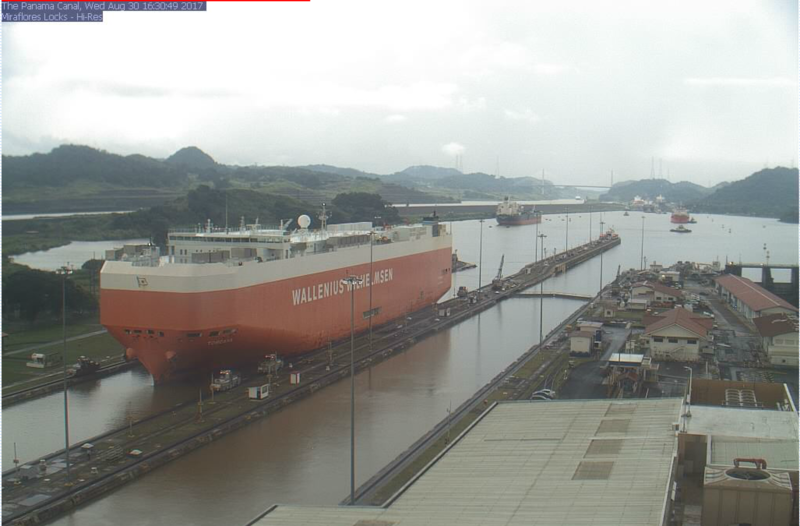 My car missed the August 1st ship but made it on the W&W Toscana leaving August 10th and arriving in California on September 7th. 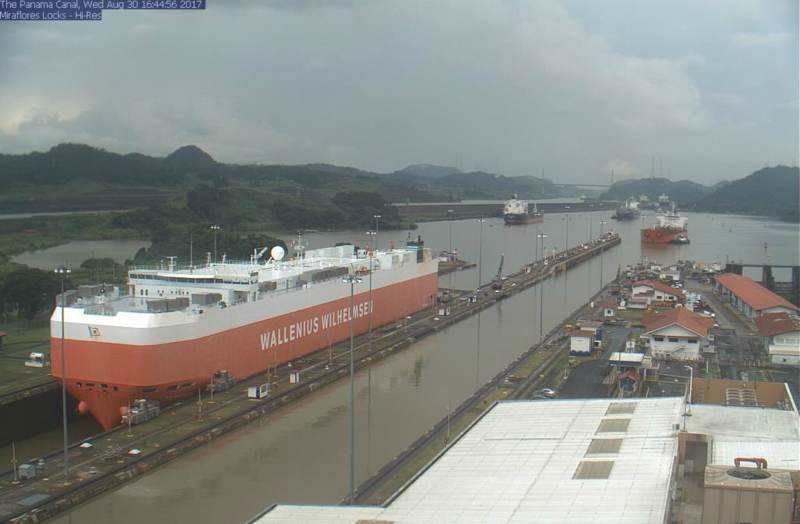 I was able to see this from W&W’s cargo tracker (using the full VIN as the Cargo ID) here as soon as August 7th. The car was unloaded at Port Hueneme on September 7th as expected. It was released from customs on the 11th and then released to the trucking company on the 15th. Finally on September 19th the car made it to the dealership lot in SoCal and was ready for pickup the next night! 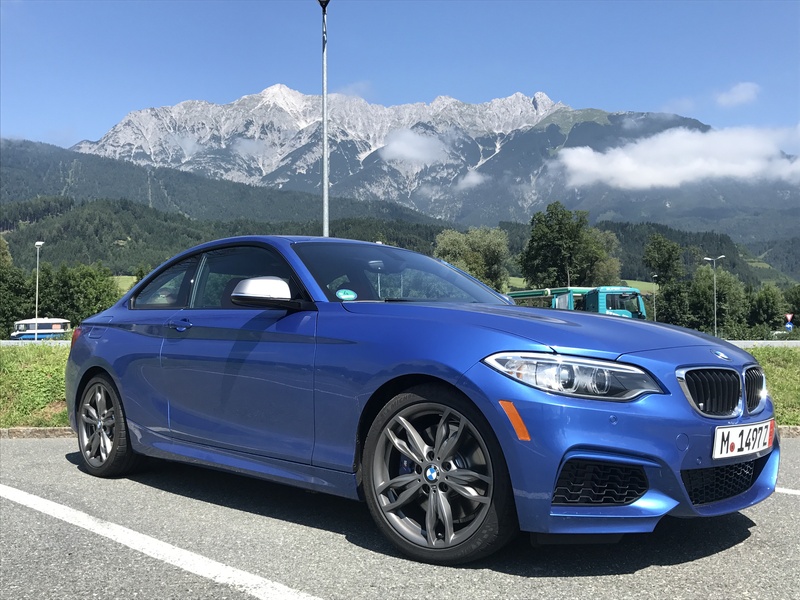 So in the end, it took 8 weeks and 2 days to get my car back, not bad for west coast delivery, dropping off outside of Munich (supposed to delay an extra week), and the potential for ED cars to get held up in U.S. customs. Last edited by keylime503; 10-12-2017 at 01:09 PM. Man!! What a trip! Makes me miss Germany that much more!! Went to Oktoberfest and visited the Welt as well. I need to get a lease so I can copy your route! Great write up! Great post and trip! You visited a lot of the places I did during ED. I really enjoyed the Highline 179. Congratulations on the M240 - and 6MT as well! Hows the front plate mounted when you do ED? Do they drill holes in your front bumper? No holes, they attach it with some really strong double-sided tape! that's good to hear. 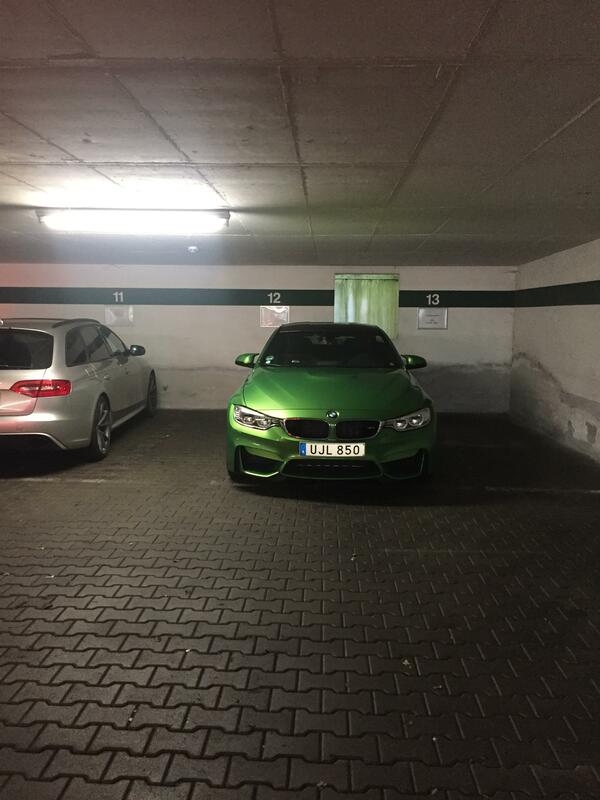 only other concern would be driving around Europe without paint protection film on the car. wonder if you can get that done locally prior to delivery. First let me say. What a very nice review of your trip. Looks like it was s blast. I do have a question for you. 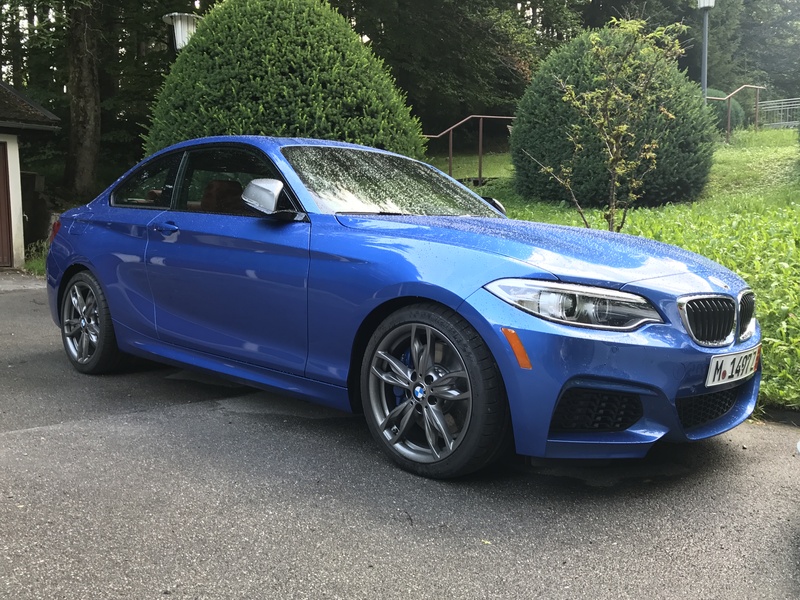 I just took an m4 convertible individual (exterior/interior) delivery and drove Europe for a month. Just got back last week. If I wanted to share that experience can you advise in what section of the form I could post a similar narrative? Thanks. Very cool!! Missed European Delivery.